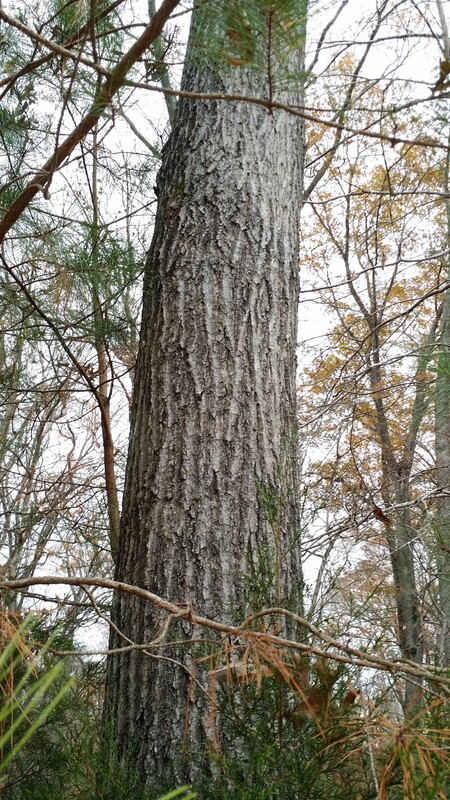 Southern Grape Ferns (Sceptridium biternatum) are common in moist forests throughout the Piedmont of North Carolina. 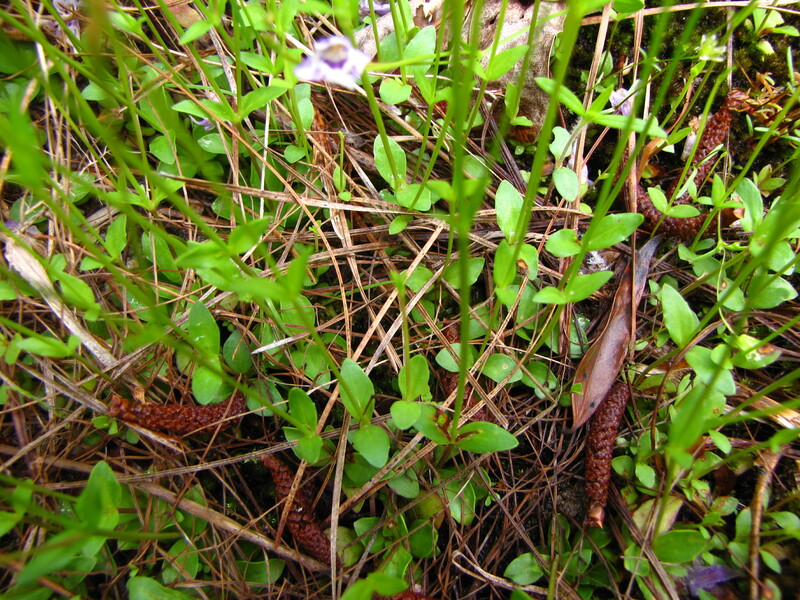 They are small ferns, usually 3 to 6 inches across, and have a fleshy, succulent texture. They are members of the Adder’s Tongue family (the Ophioglossaceae), which is sometimes referred to as a family of succulent ferns. 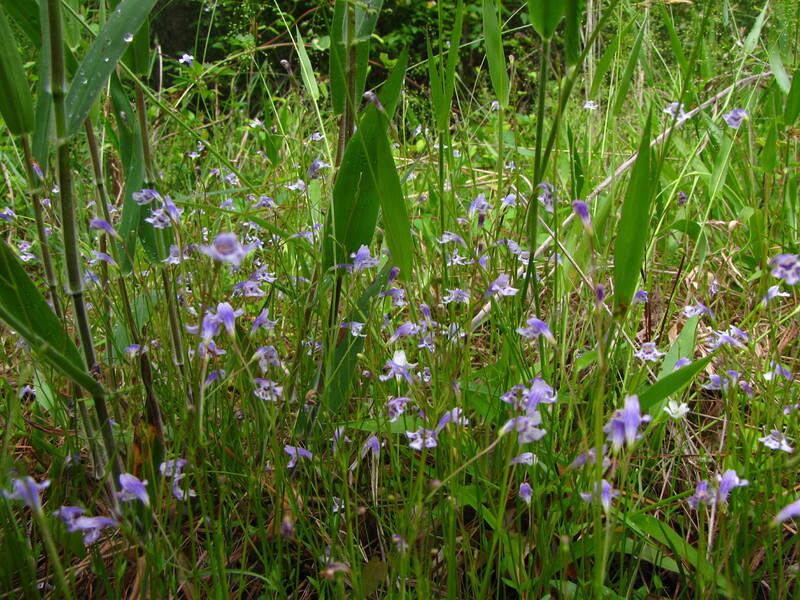 Until fairly recently, they were classified as Botrychium biternatum, and the new genus name of Sceptridium has been slow to be recognized. 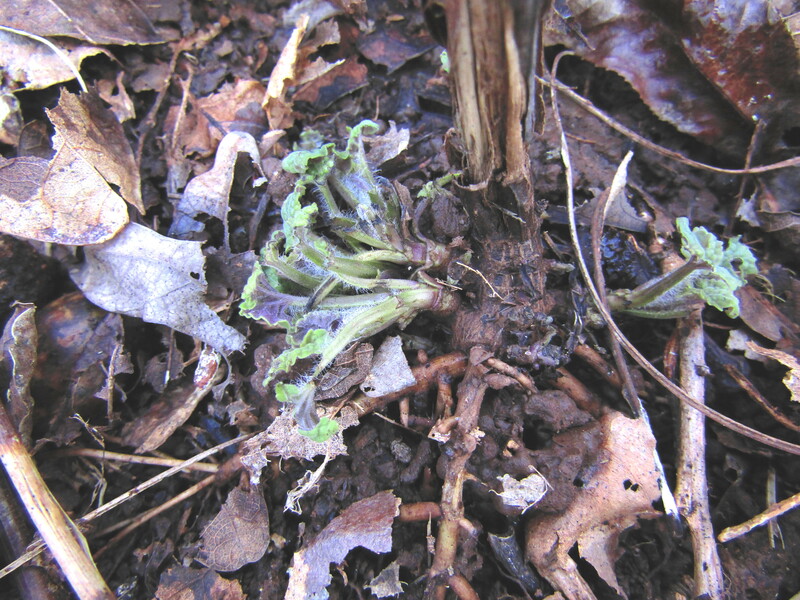 Southern Grape Ferns emerge in the summer and early fall, and remain throughout the winter. 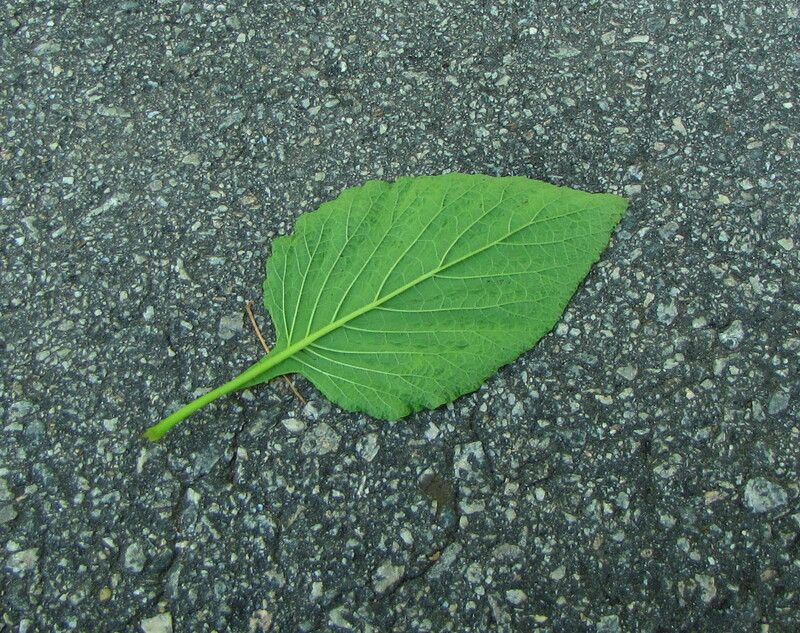 Pictured below is the typical form most frequently seen on the forest floor. They often appear in small clusters, as illustrated below. Southern Grape Ferns are variable in color, shape and size. An individual with a yellow tinge is shown below. 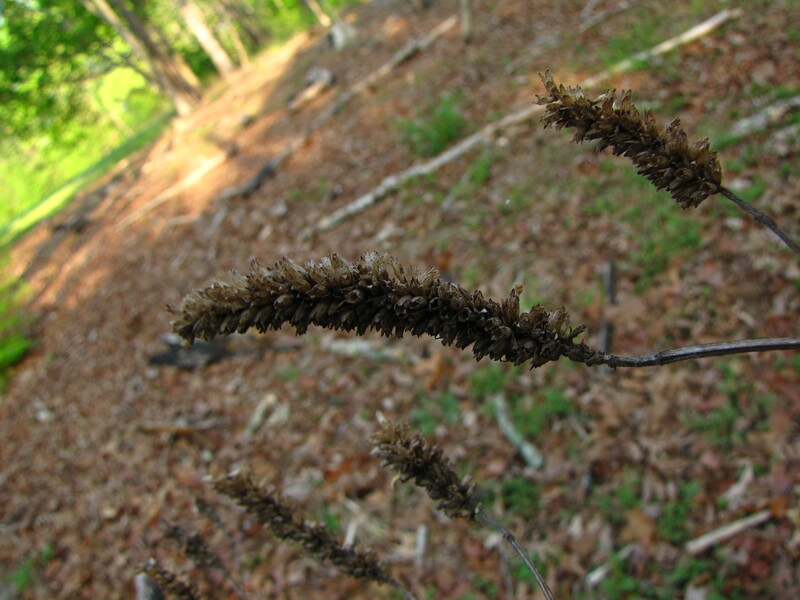 In the fall, fertile fronds arise from the base. A frond is the leaf of a fern, and a fertile frond is a highly specialized frond that differs markedly in form and size, and carries the sporangia. 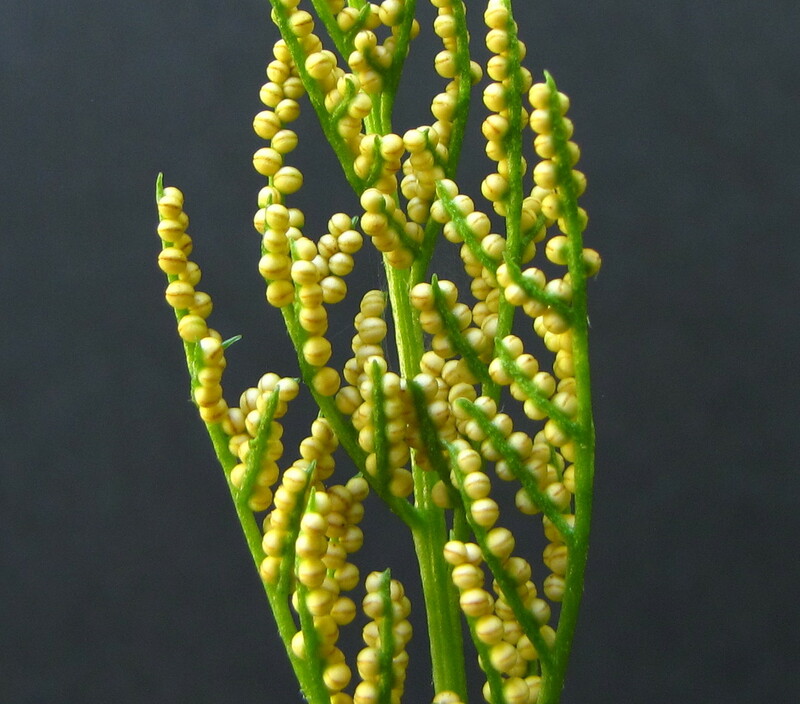 The sporangia are the cases or capsules that bear the spores of the fern. Below is a closer look at a fertile frond bearing sporangia. The shape of the fertile frond is said to resemble a king’s scepter, which gave rise to the genus name Sceptridium. 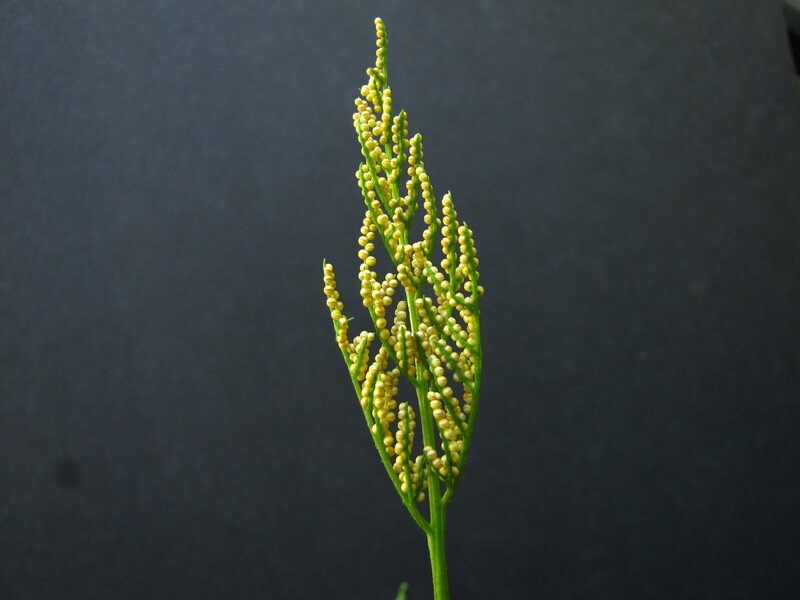 Below is a closer look at the golden sporangia. Their resemblance to clusters of grapes is the source of the common name Grape Fern. 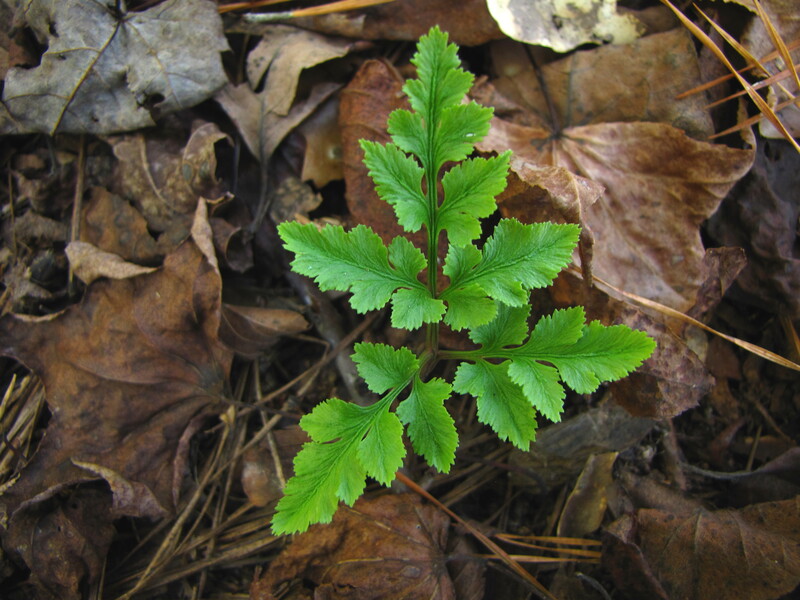 Sceptridium dissectum – the Cut-leaf Grape Fern – is a close relative of the Southern Grape Fern, and is rare in Central North Carolina. 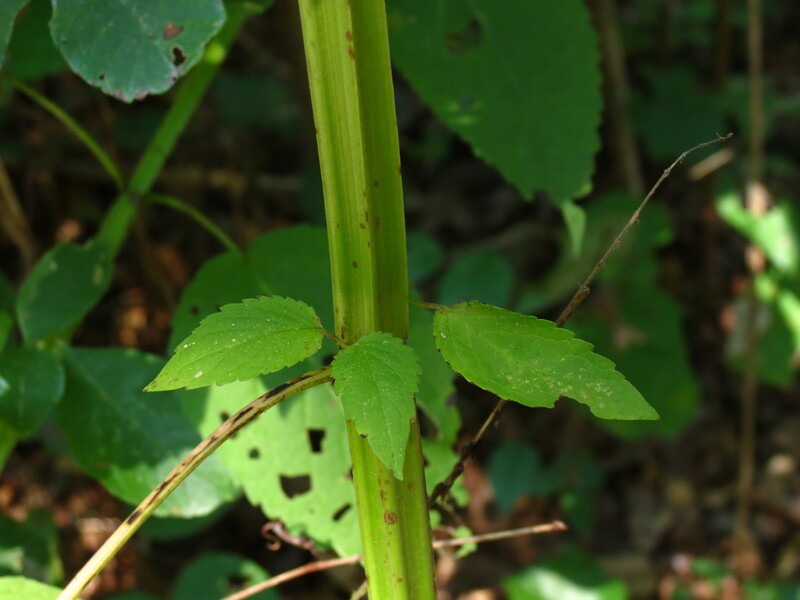 It was also classified as a Botrychium until recently and was considered a form of the Southern Grape Fern. It has now been moved into its own separate genus and species. 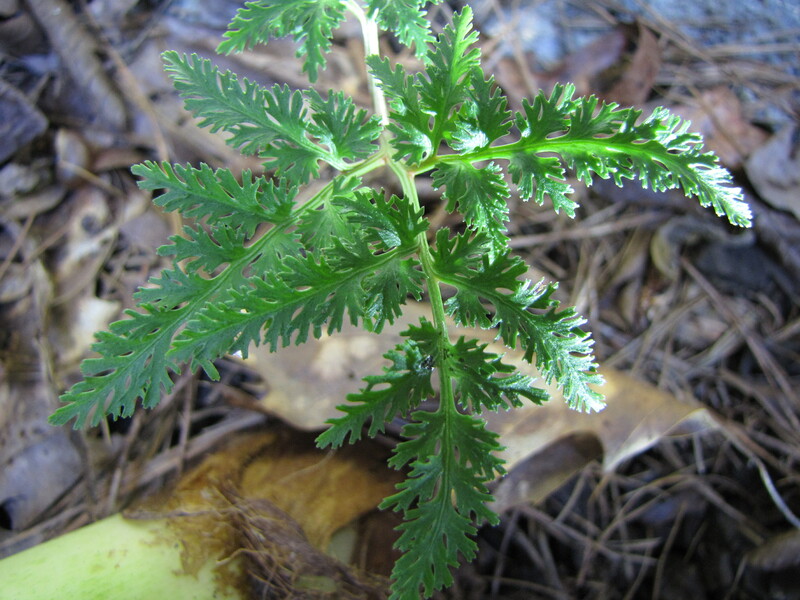 The fronds of this species are divided for a third time, creating a fragile, lace-like appearance, making it easily distinguishable from the Southern Grape Fern, whose fronds are twice divided. 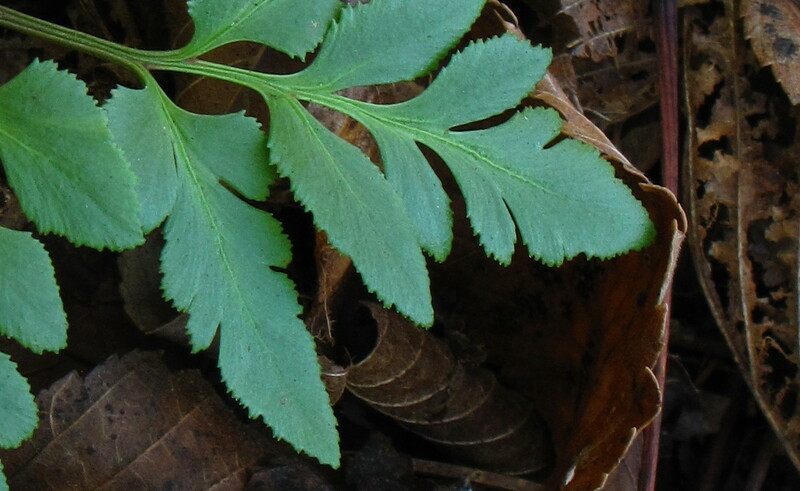 There are two forms of the Cut-leaf Grape Fern; one of them complicates field identification. Forma dissectum is the rare one illustrated by the two photos above. It is easily identified. 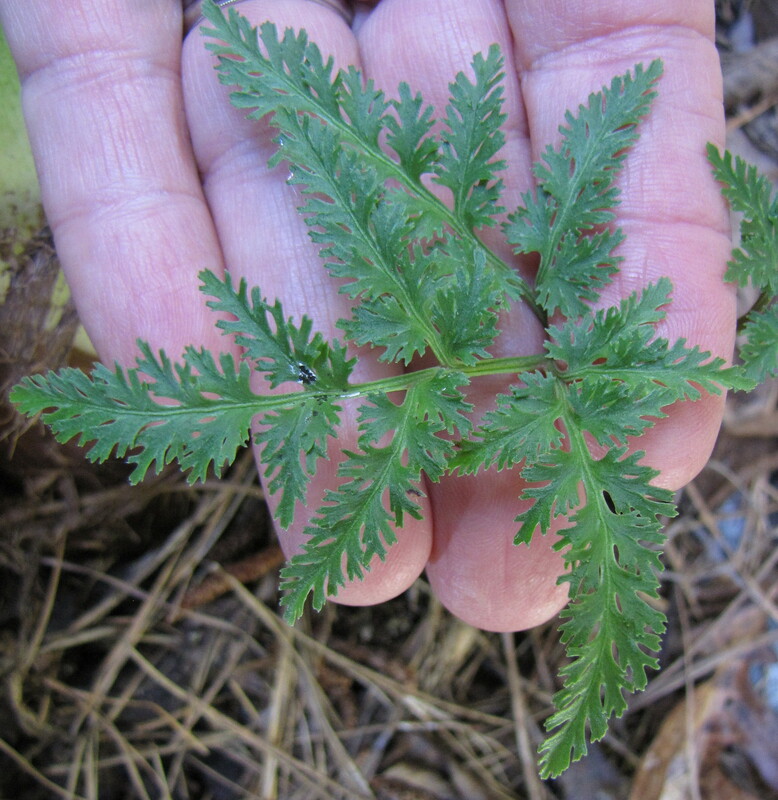 Forma obliquum (not illustrated) is much more common and can closely resemble the Southern Grape Fern, leading to confusion. 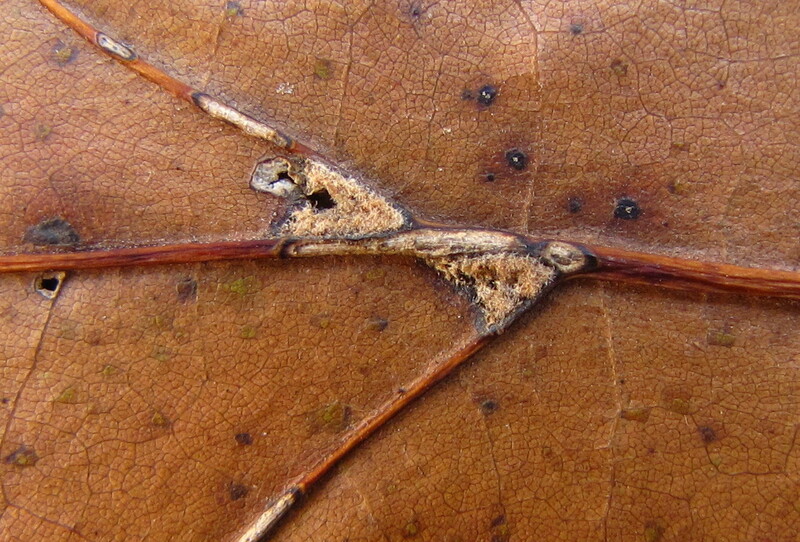 Perhaps the best way to be certain of identity is to look closely at the margins of the frond. The two close ups below show the sharply serrated margins of the fronds of Southern Grape Ferns. These serrations can be seen in the field without magnification. The frond margins of both forms of the Cut-leaf Grape Fern are usually completely smooth or at most have indistinct or obscure serrations. 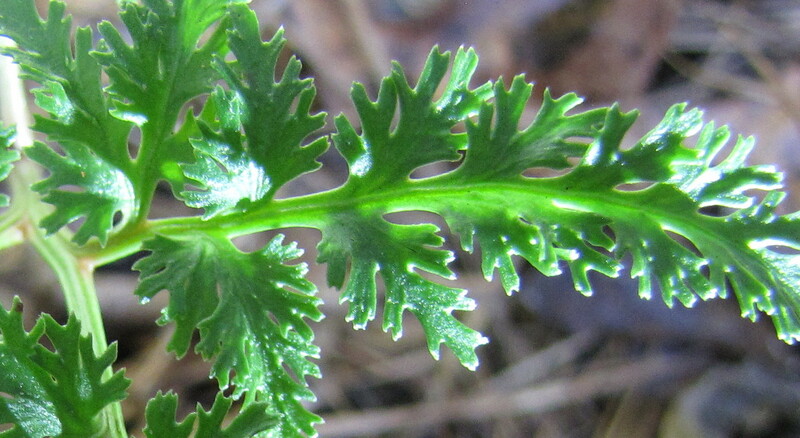 The close up below shows the divisions of the frond, looking like jigsaw pieces, but the complex margins can be seen as completely smooth without serrations. 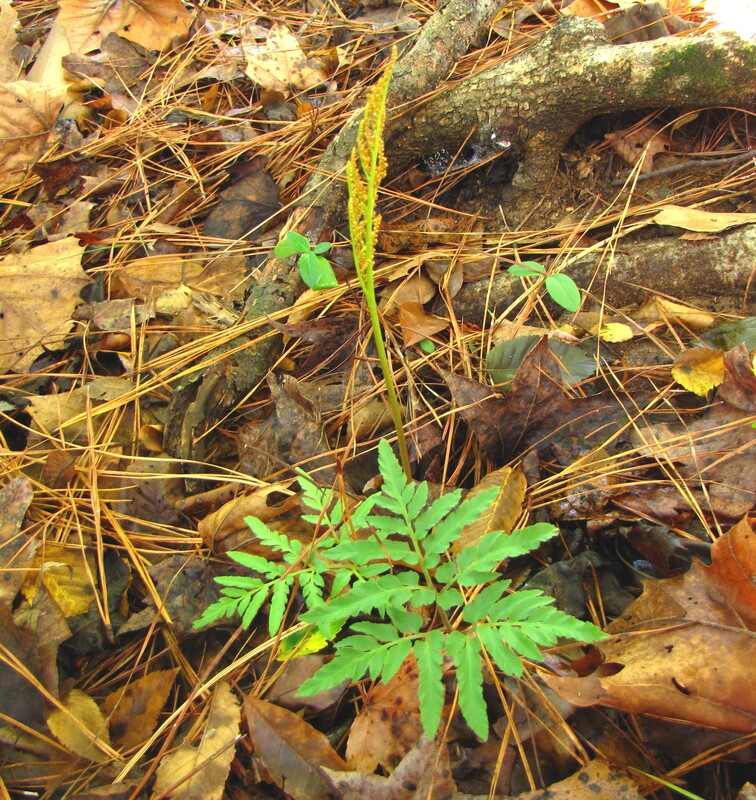 The Southern Grape Fern (Sceptridium biternatum) can also be confused with the Rattlesnake Fern (Botrypus virginianum) which has a very similar form and appearance. There is a simple way to distinguish them. The Rattlesnake Fern is deciduous and the Southern Grape Fern is evergreen. 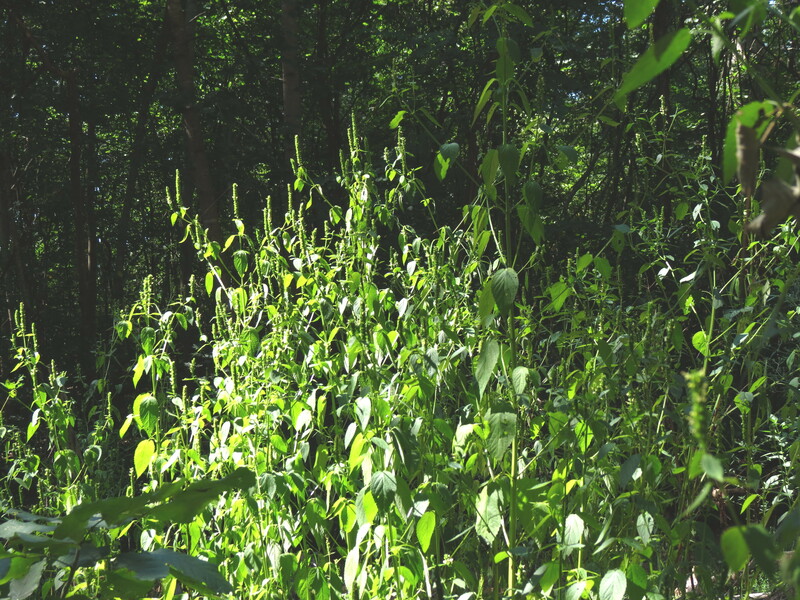 The Rattlesnake Fern arises in the spring and is gone by late summer and fall. 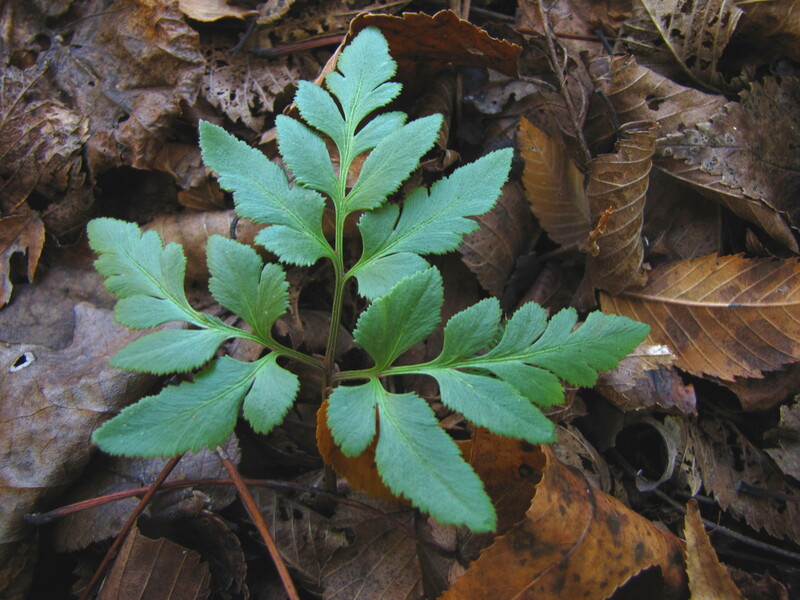 The Southern Grape Fern arises in the summer and fall, and remains throughout the winter. 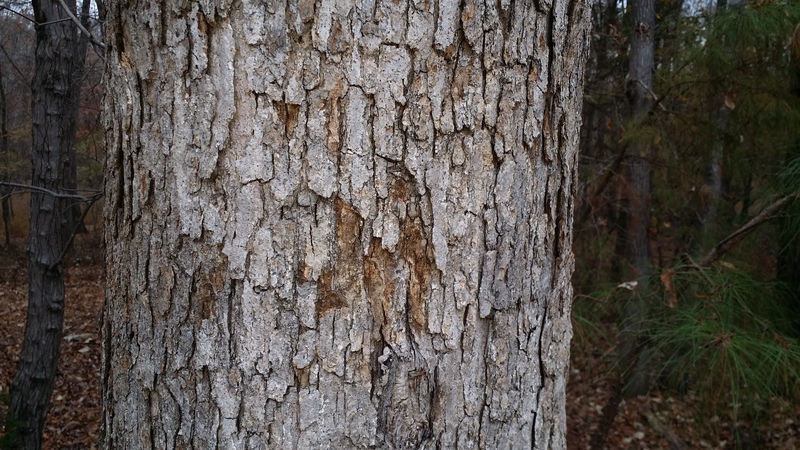 The Southern Hackberry (Celtis laevigata) is a common tree in the Piedmont of North Carolina, often occurring along rivers and streams, and in suburban parks. 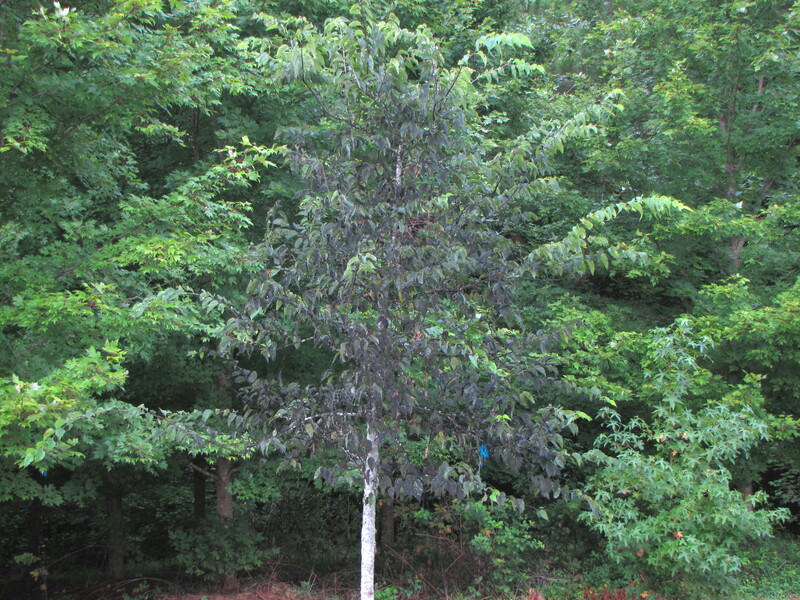 In one large park near Falls Lake, and in the surrounding forests nearby, many Southern Hackberries are visibly discolored and ragged looking, as if someone had tossed a bucket of soot or ash over the foliage of the tree. 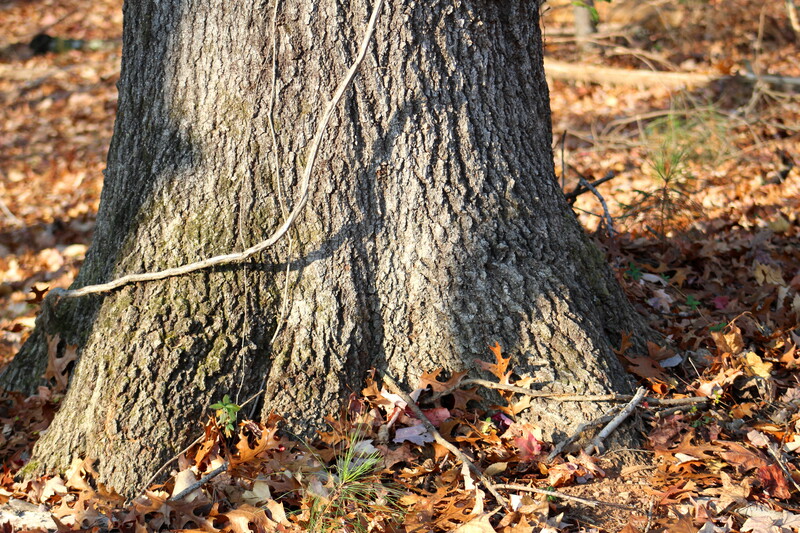 The two trees pictured below illustrate this appearance. 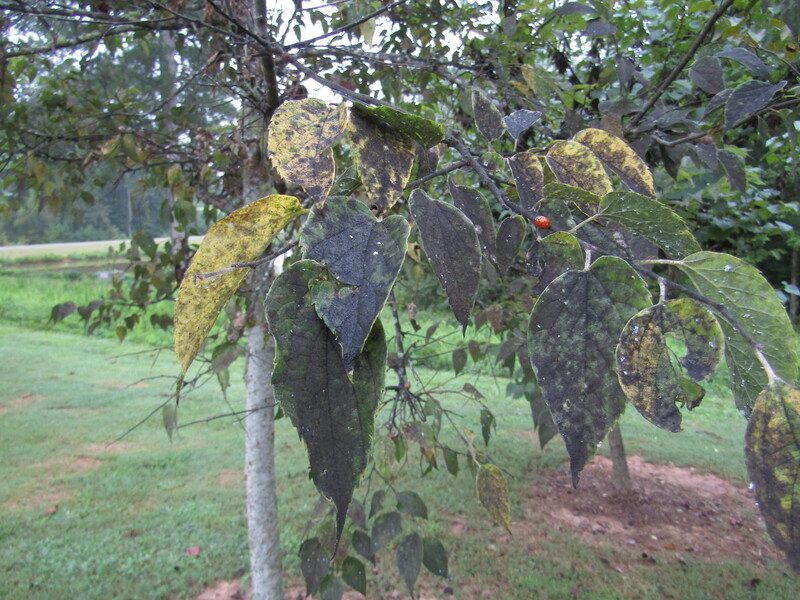 Closer examination of the foliage shows most of the leaves covered with a sooty mold. 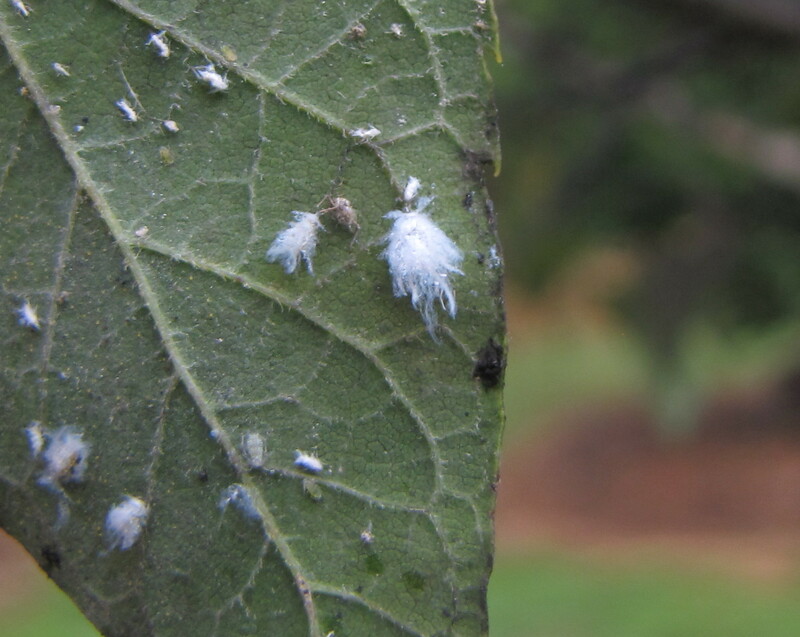 Examination of the undersides of the leaves reveals an extensive infestation of Hackberry Wooly Aphids (Shivaphis celti), an Asian species that may have been brought to the U.S. by the importation of Chinese Hackberries (Celtis sinensis). 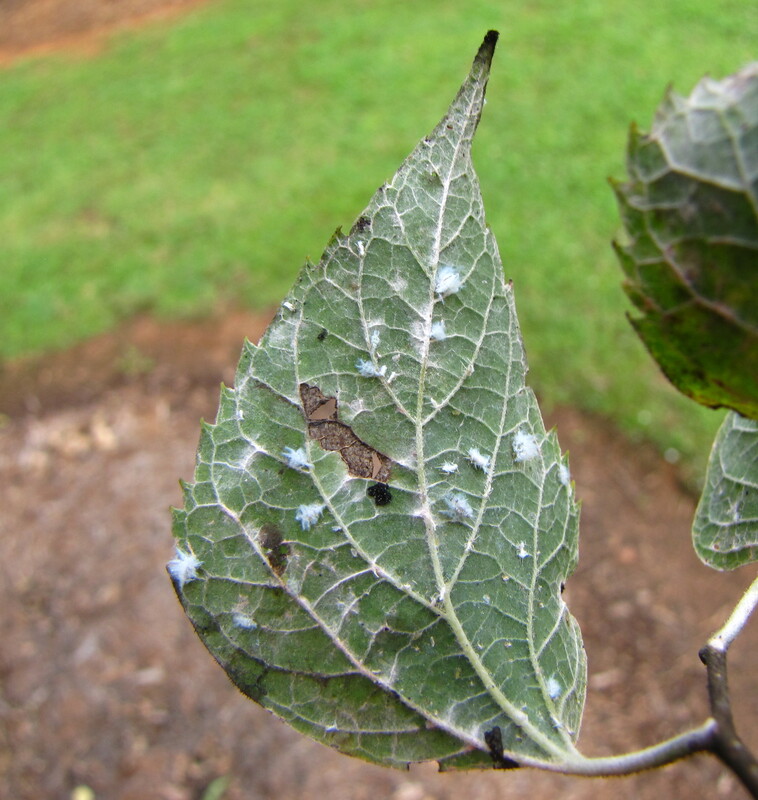 The Hackberry Wooly Aphid secretes lavish amounts of honeydew, so much that the leaves and twigs become coated with the sticky substance. The honeydew acts as a perfect substrate for the fungus – usually called sooty mold – which covers the leaves. 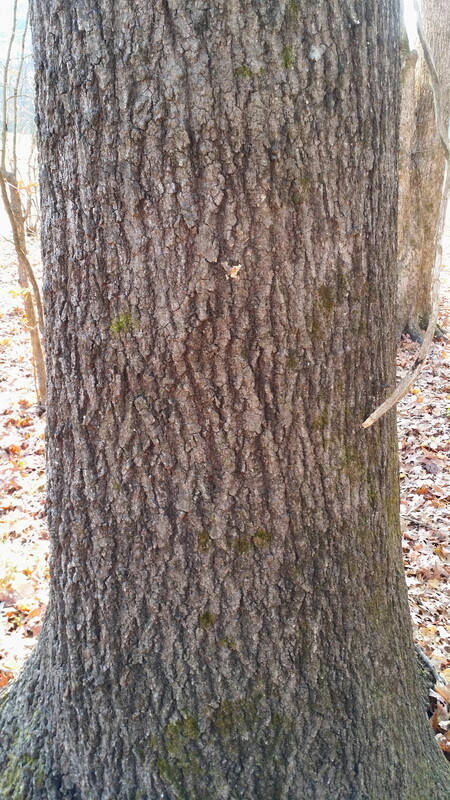 The fungus does not kill the tree, but does cause some leaf drop. The honeydew, which is rich in carbohydrates, attracts ants ,which do not harm the aphids but instead benefit them by protecting against predators. 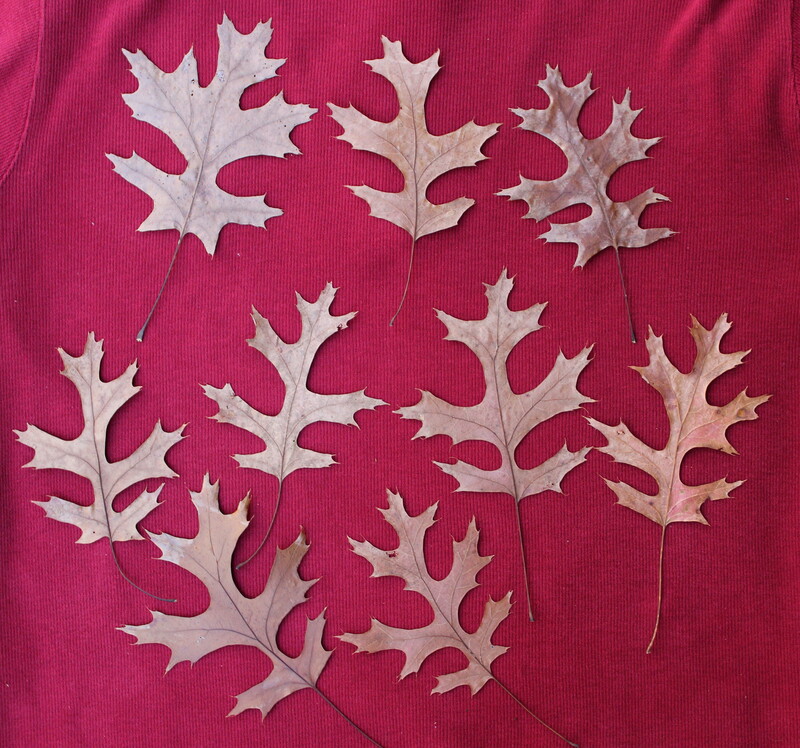 The photos below provide several more views of the leaves covered with sooty mold. 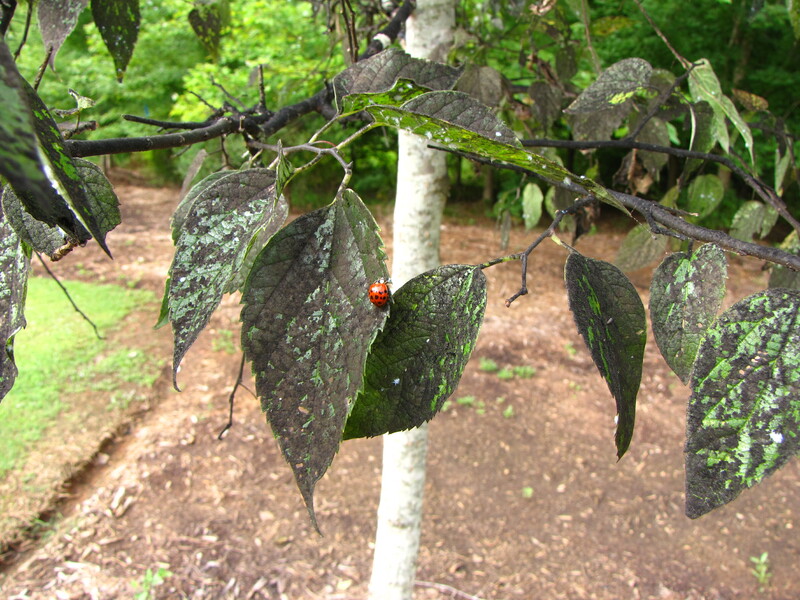 Also seen are orange lady beetles that are present in small numbers on the affected trees. 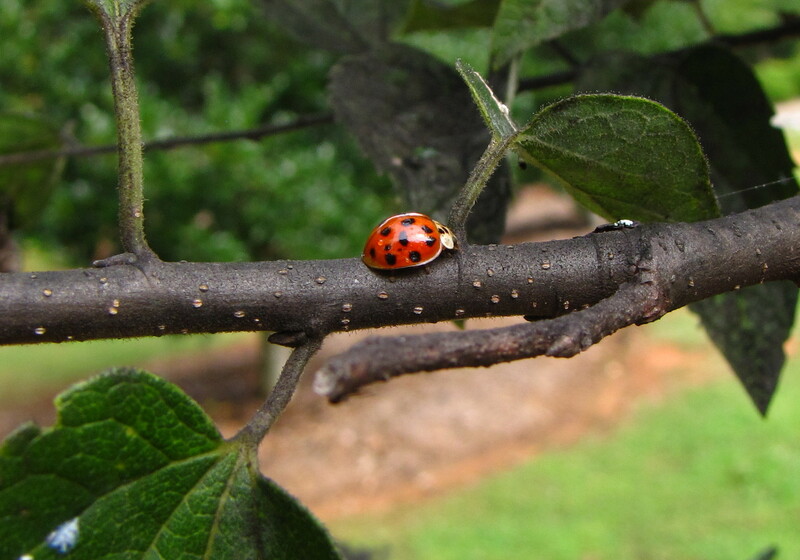 The lady beetles are the Asian Multicolored Lady Beetle (Harmonia axyridis), a major predator of the wooly aphids. 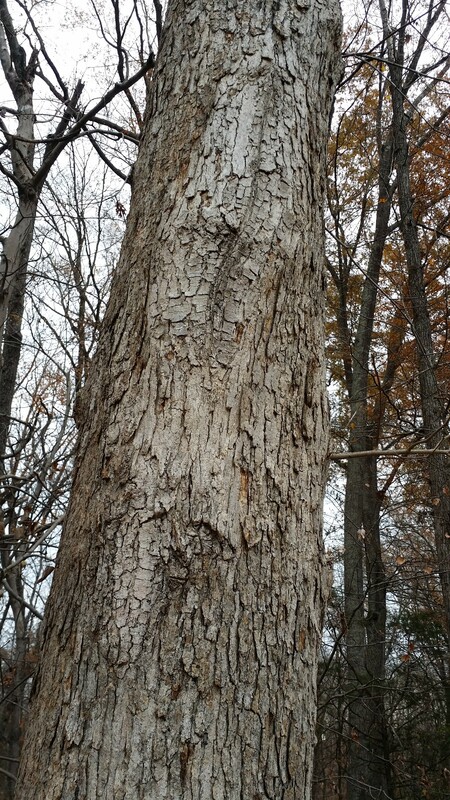 They are badly outnumbered on the affected trees and have very little impact on the course of the infestation. It is ironic that this prey and predator relationship that began in Asia continues in a similar setting on a distant continent where both species were introduced (the aphids by accident; the lady beetles both intentionally and accidentally). The Southern Hackberries are also parasitized by Leaf Petiole Galls, caused by the Hackberry Petiole Gall Maker (Pachypsylla venusta). 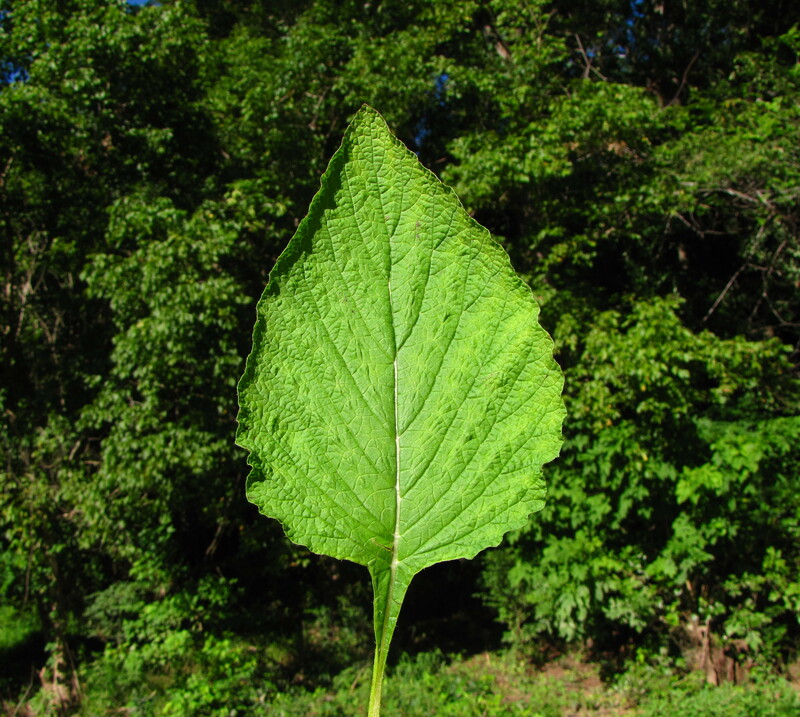 Petiole is the botanical term for the leaf stalk. 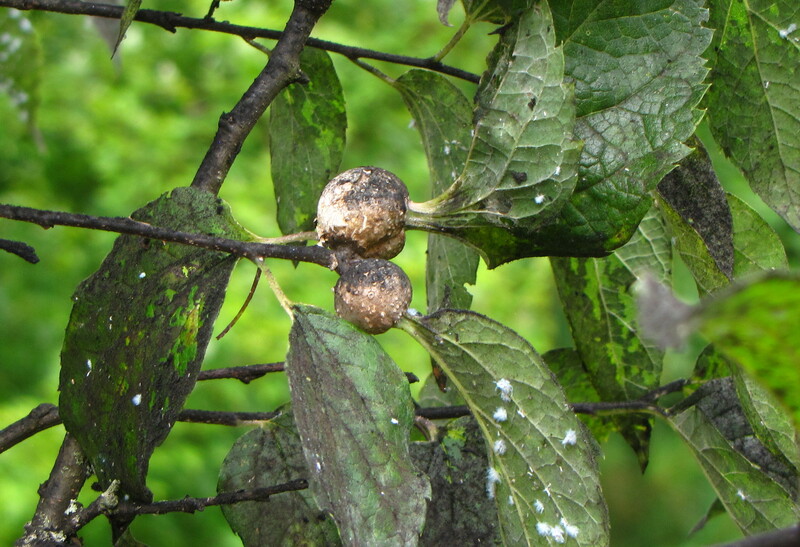 These galls are very common on hackberries and do not kill the trees, even when present in large numbers, as they often are. Several examples are pictured below. There are also small numbers of fruits on the trees. They can be distinguished from the galls by their smooth, symmetrical surface, reddish tint, and their position at the end of a stalk. 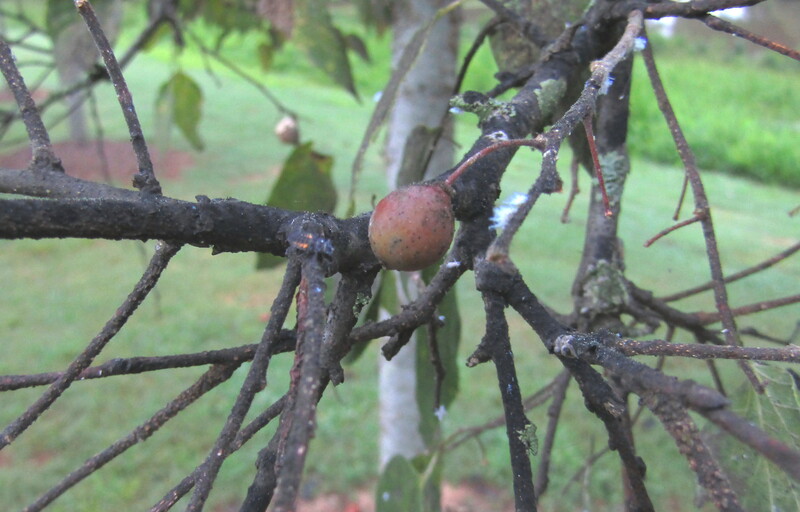 The galls are always located between a leaf and a twig and are never at the end of a stalk. 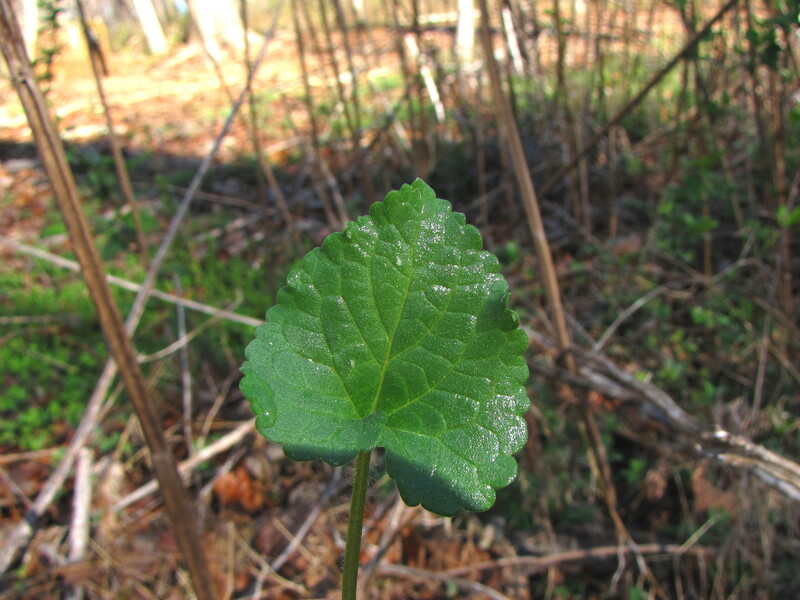 The leaves on these hackberries, and those in the surrounding forests, are quite variable. Some have few to no serrations while others are serrated on each margin. 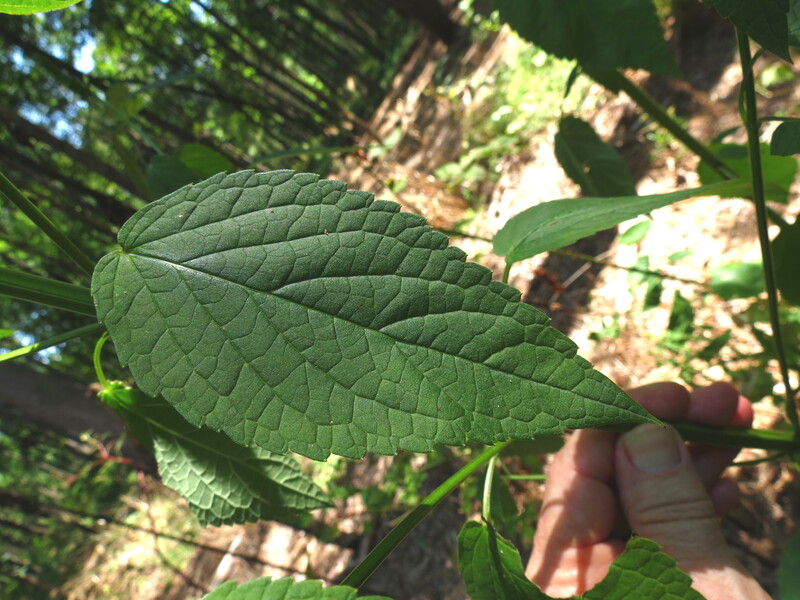 Weakley’s Flora (May 2015) now recognizes the hackberries that have significant serrated leaf margins as Celtis smallii, and it is possible that these trees and others at Falls Lake may fall into that category. 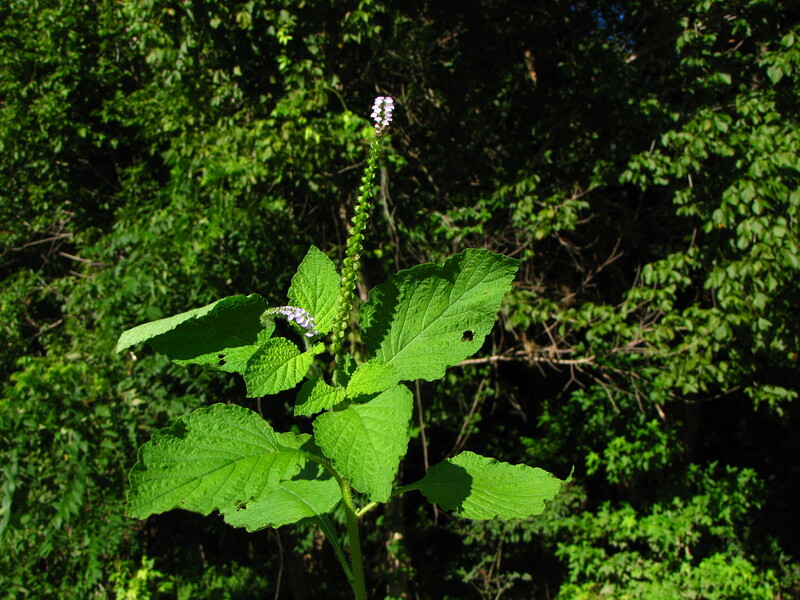 Indian Heliotrope, Heliotropium indicum, is an introduced annual, probably from Tropical America. 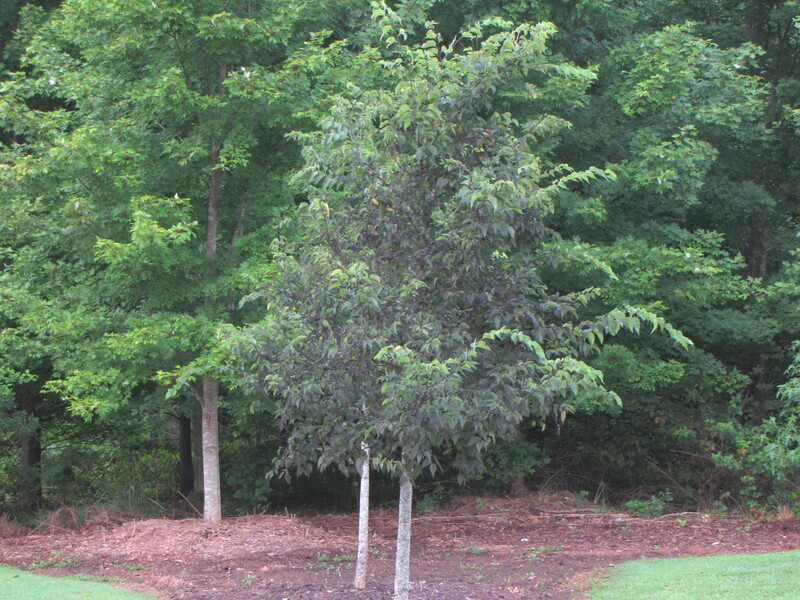 It is uncommon in North Carolina, being absent from the Western Piedmont and the Mountains. 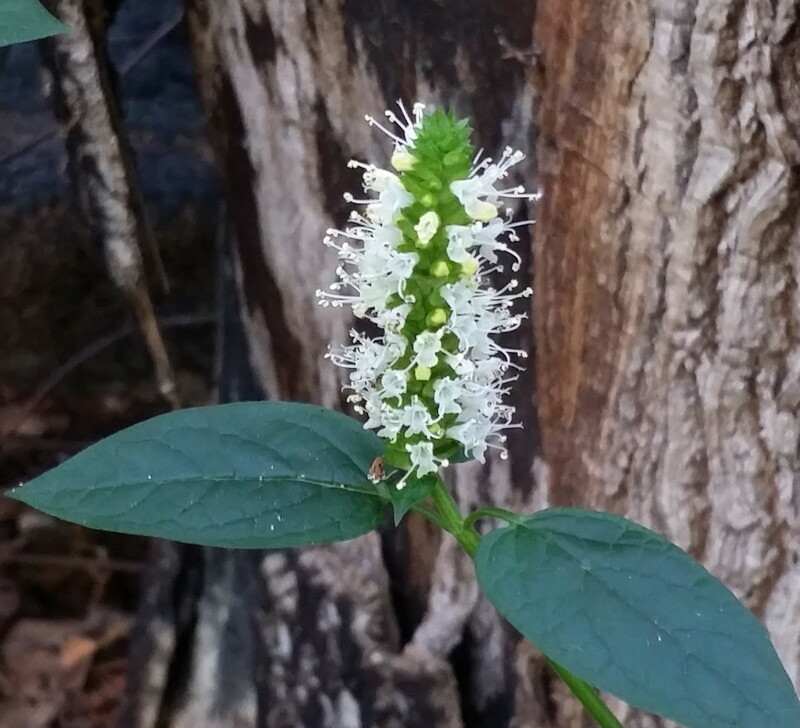 It is seen occasionally in small, isolated populations along the Neuse River Trail. 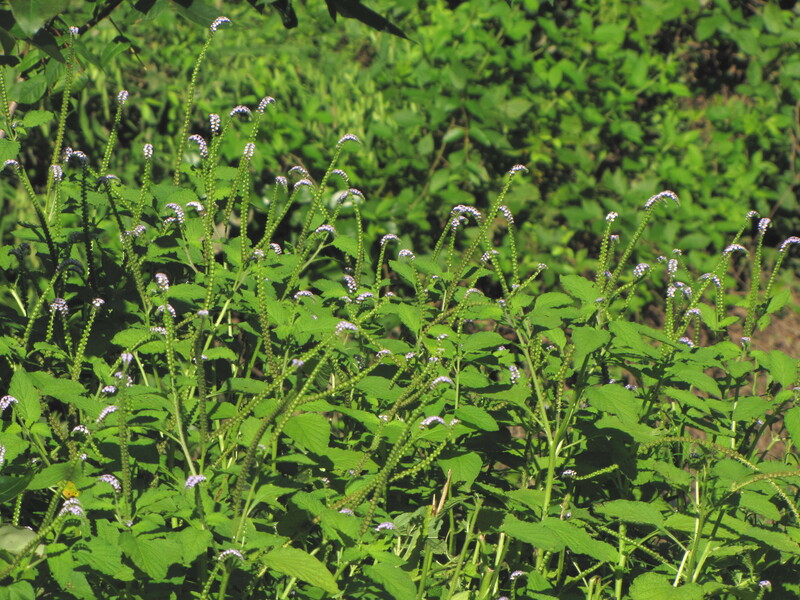 Unlike the garden Heliotrope (H. arborescens), which is known for its bright purple flowers and wonderful scent, Indian Heliotrope is considered an invasive and troublesome weed in many parts of the world. Its small but beautiful flowers are reminiscent of Forget-me-nots, which are its close relatives in the Borage Family, the Boraginaceae. The flowers bloom in elongated, gracefully curved clusters, with the younger flowers occurring near the end of the cluster, and the older flowers beginning to turn to seed at the base. Photos of several populations are shown below. 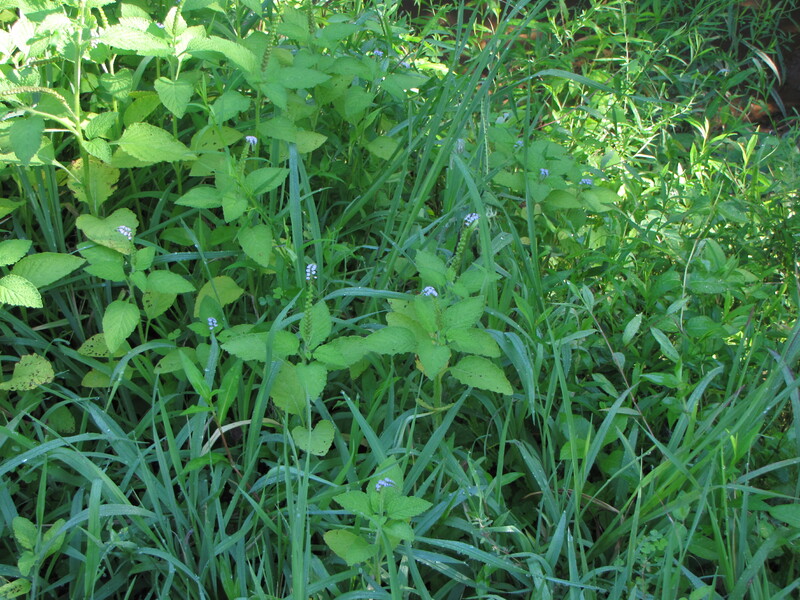 Some are small and mingled with grasses at ground level, and some are shrub-like, four to five feet tall. 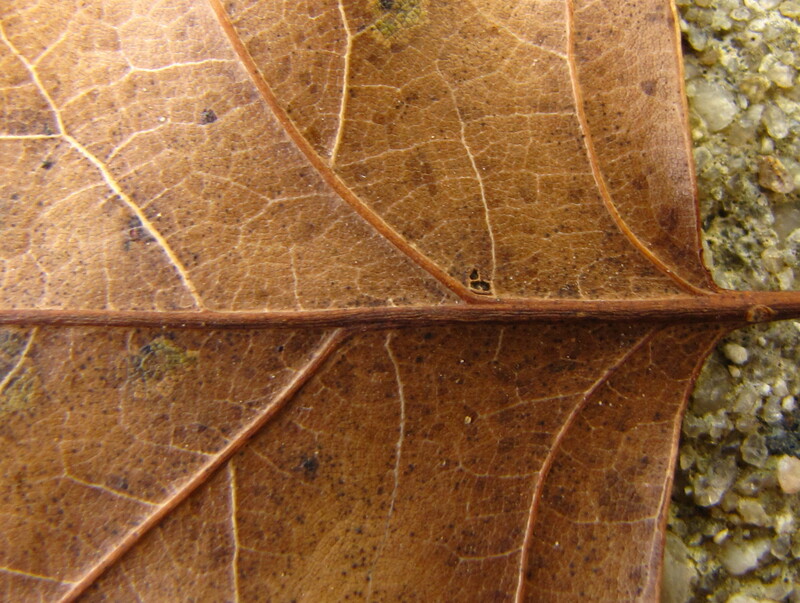 The typical plant form is illustrated by the two photos that follow. 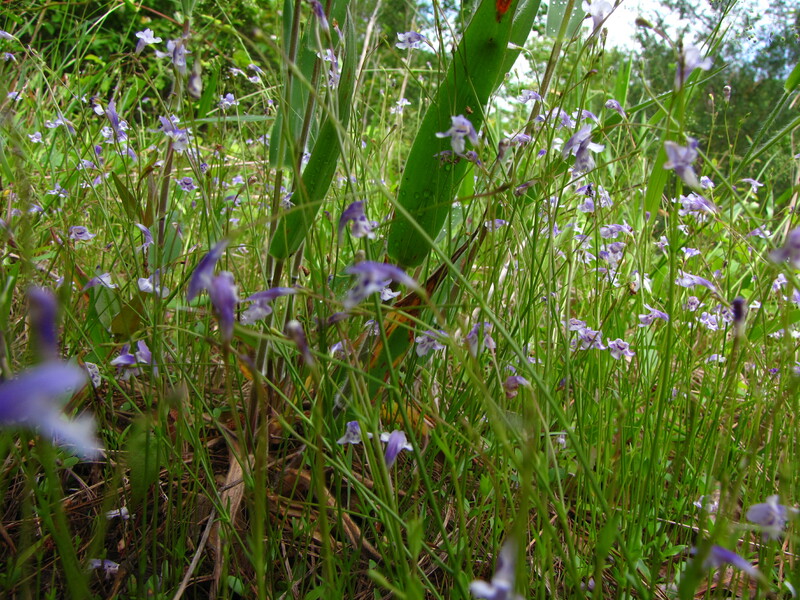 The plants tend to be broad and low to the ground initially, rising in height as they begin to bloom. 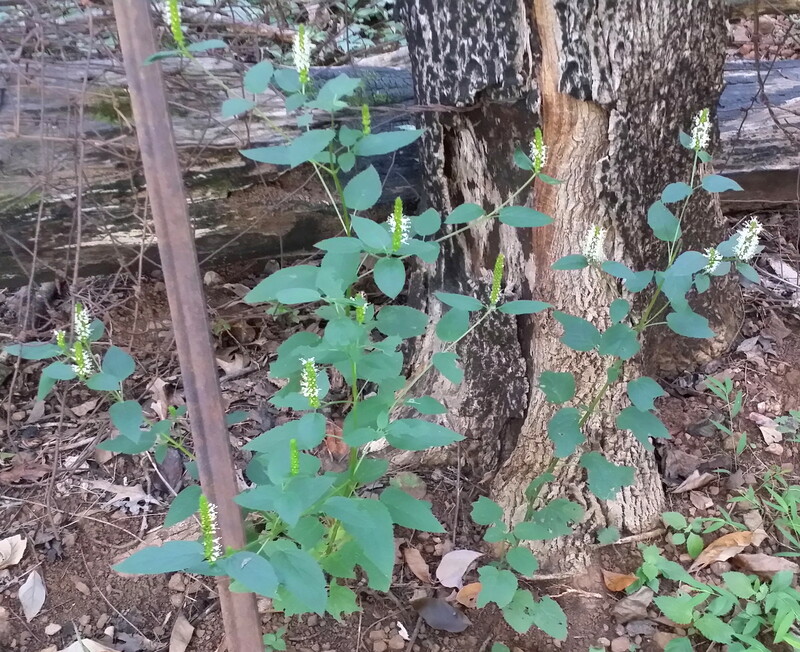 The flower clusters can be elongated and very striking. 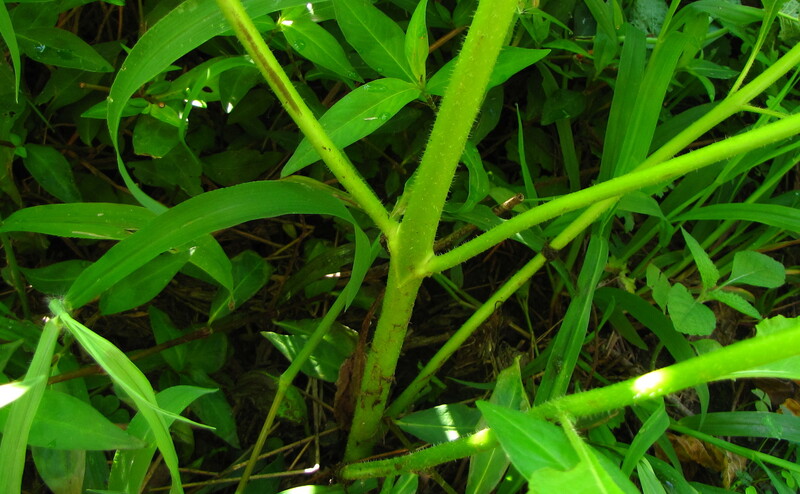 Their appearance gave rise to the common names Scorpion Weed and Scorpion Tail. 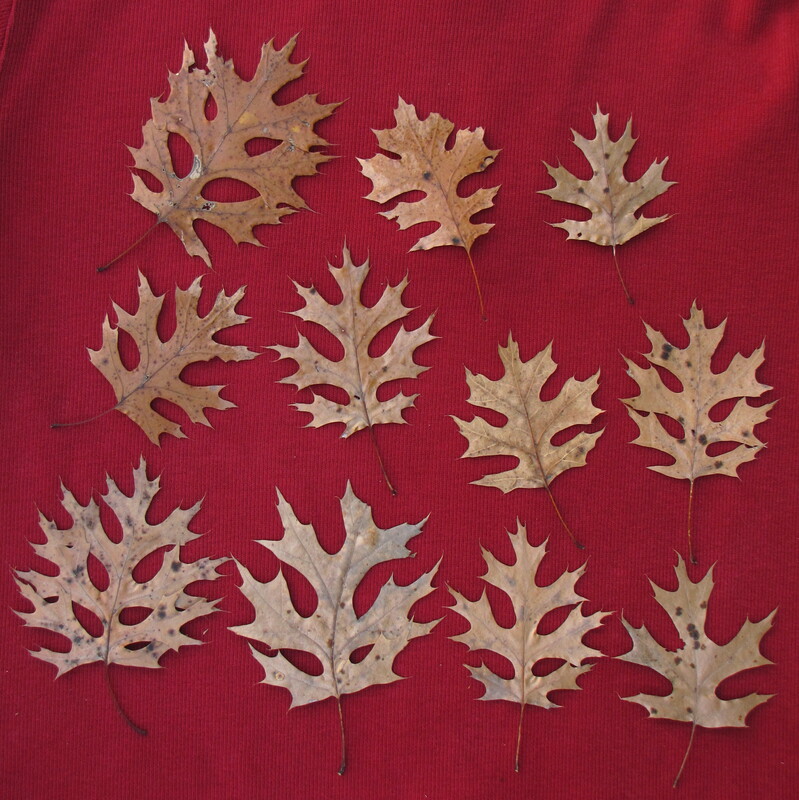 The leaves are broad and ovate, with a wrinkled upper surface, and are usually (but not always) alternate on the stem. An interesting attribute of Heliotropes – their flowers turn and follow the sun as it travels across the sky. The name was based on the Greek for sun (Helios) and (trope) for turning or tropism. 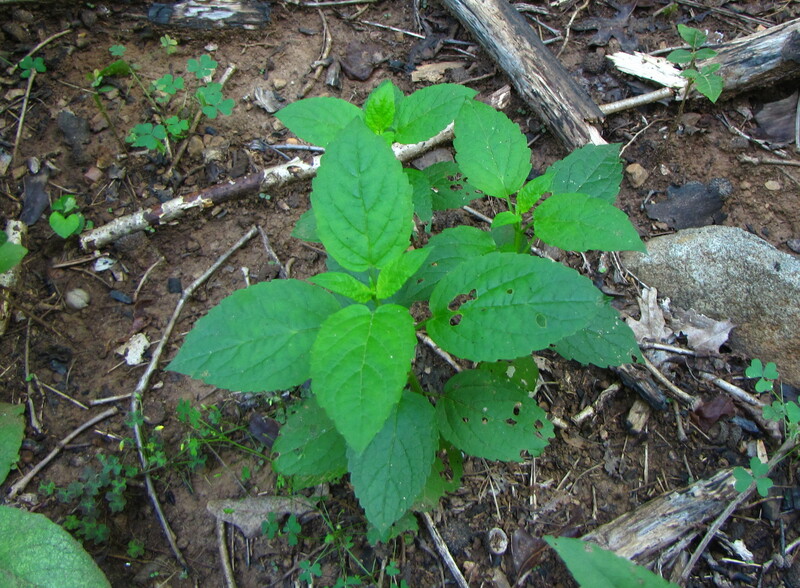 Turnsole, an old English term with a similar meaning, is also another common name for Heliotrope, and is the common name used for Heliotropium indicum in Weakley’s Flora. 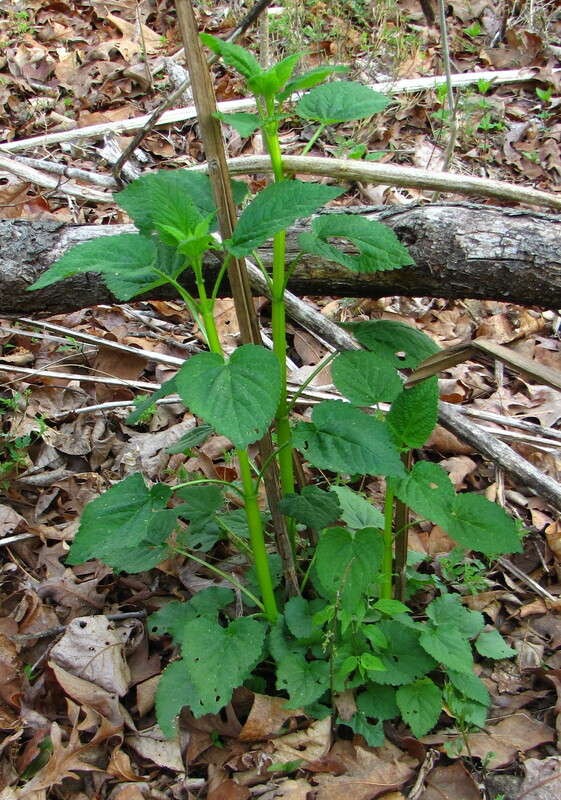 The Hairy Nightshade (Solanum sarrachoides ) is an introduced species from South America which is uncommon to rare in North Carolina. It is listed as occurring in only five North Carolina counties. 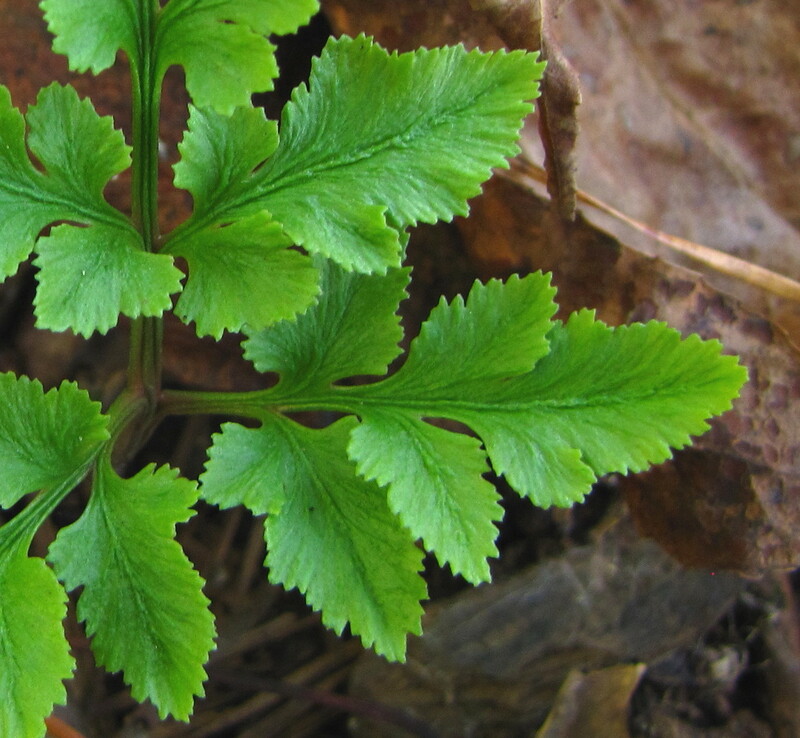 With this plant, scarcity is a good thing. 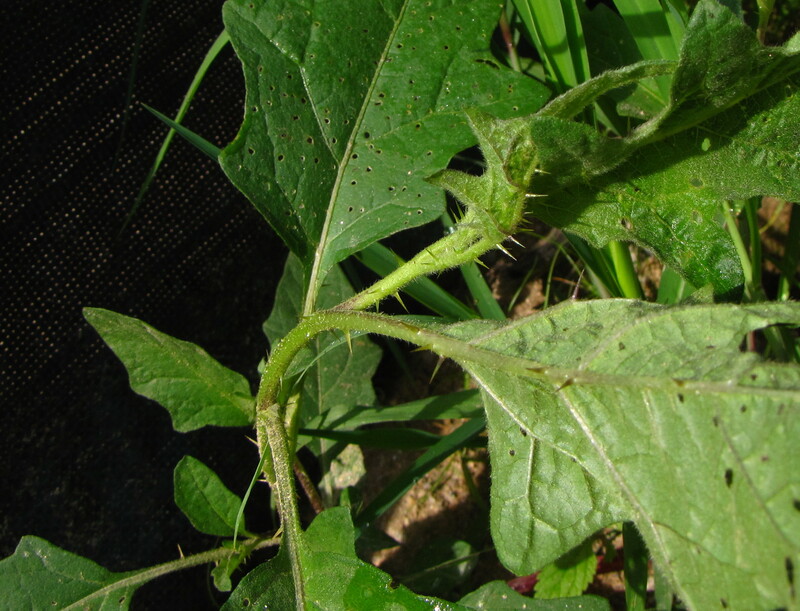 Like many of its nightshade relatives (family Solanaceae), Hairy Nightshade is a serious agricultural pest of potato fields and is poisonous to livestock across its range. It was identified as the cause of death to a small group of Black and White Ruffed Lemurs at a zoo in California. Three of these lemurs were released into a brand new outdoor natural enclosure, that unfortunately also contained a group of Hairy Nightshade plants. Twelve days later, one lemur was dead and the others in critical condition. Eventually a second lemur died, but the third finally recovered. 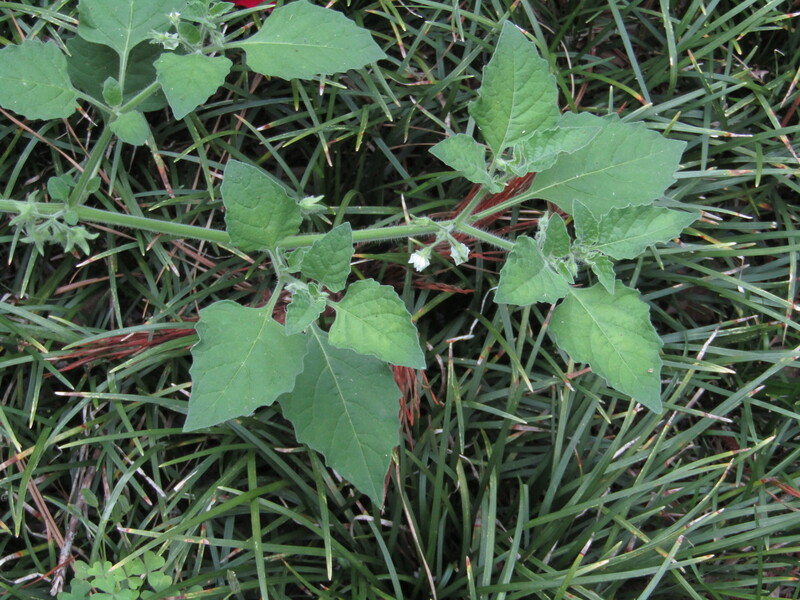 Hairy Nightshades are summer annuals found in open areas, gardens, agricultural fields, and disturbed places. 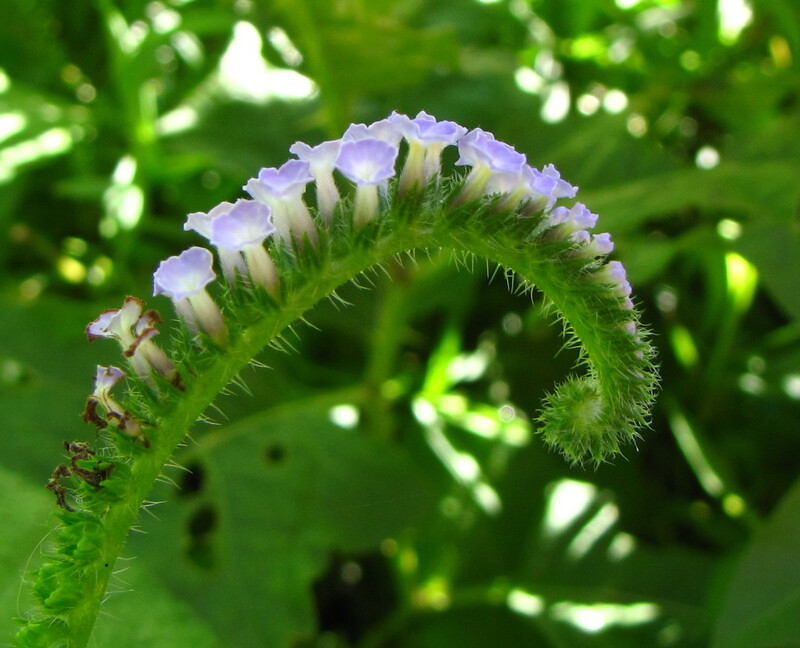 They are large, densely pubescent plants covered with sticky, glandular hairs and small, white flowers. 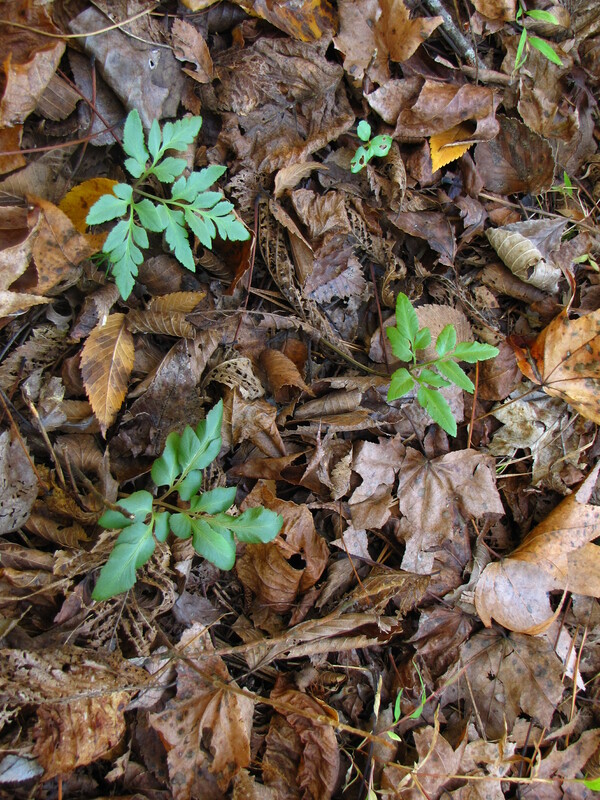 The plant in the photographs below was found in a rural Wake County garden (bringing the county total to six). In the following photo, an eight foot metal tape is stretched across the plant. 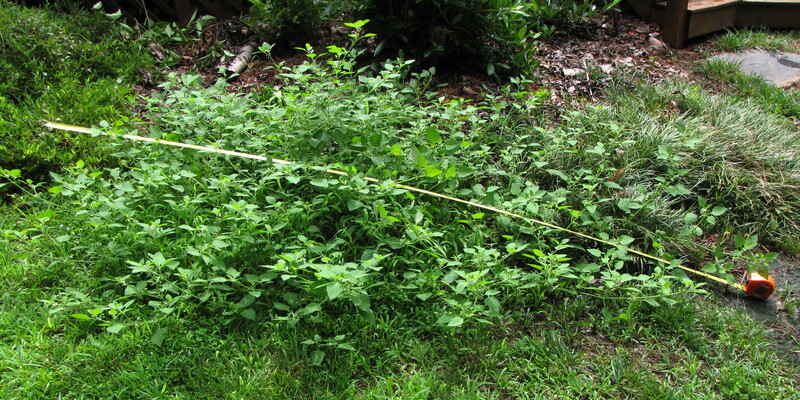 It measures eight feet in length, five feet in width, and 2 feet high – a huge plant. 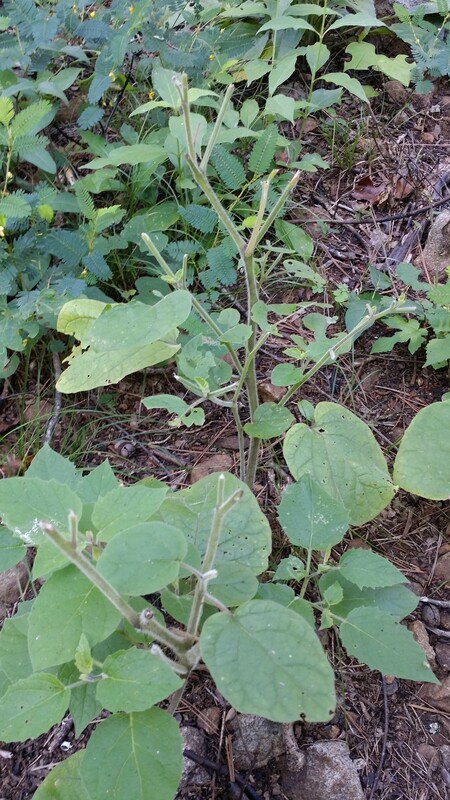 The leaves and stems are soft and clammy to the touch. 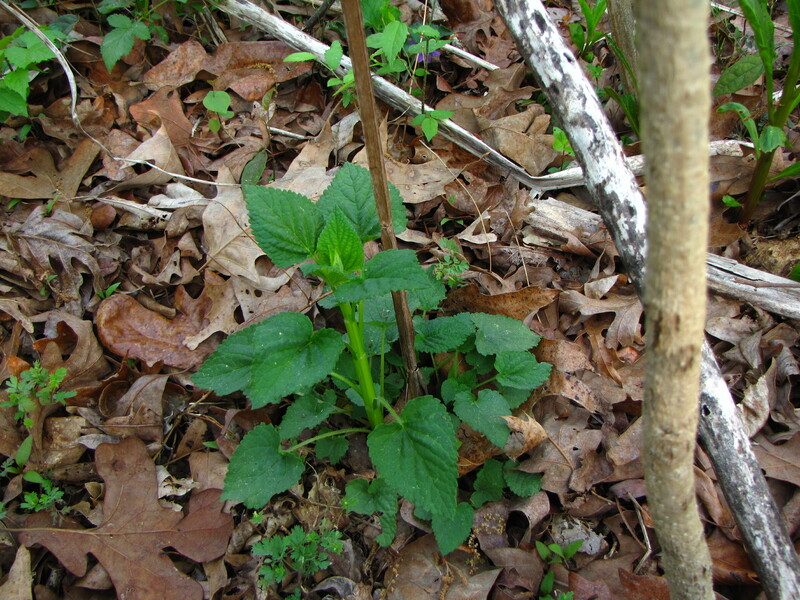 The leaves are ovate to nearly triangular in shape with small lobed margins. It is impossible to touch or handle the plant without getting a sticky residue on the hands. 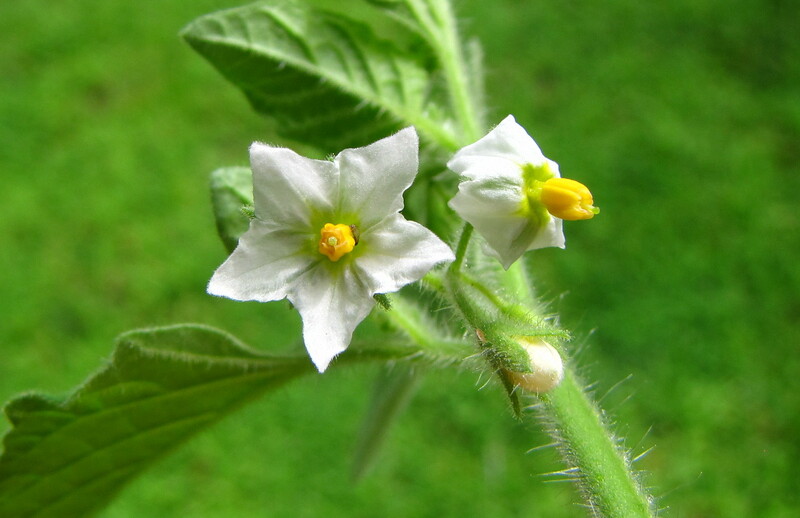 The flowers are fairly typical for nightshades with 5 white petals that are fused at the base. 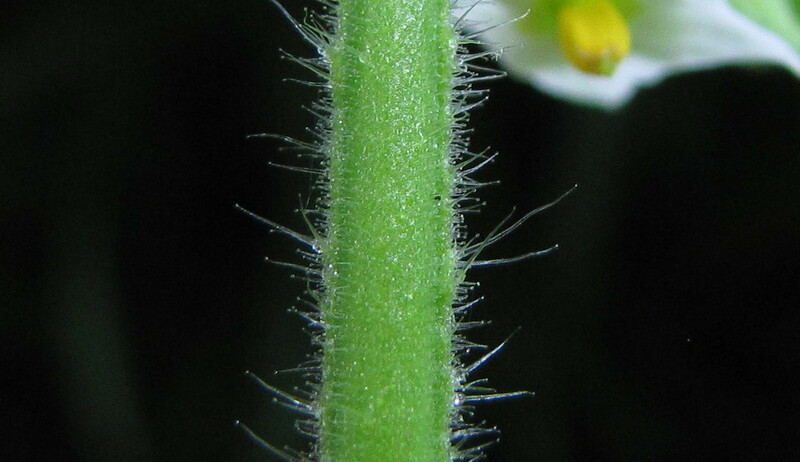 A column of 5 stamens rise out of a green area at the base of the petals; the green style can be seen slightly protruding from the stamens. The fruit is a rounded berry that usually remains green even when mature. 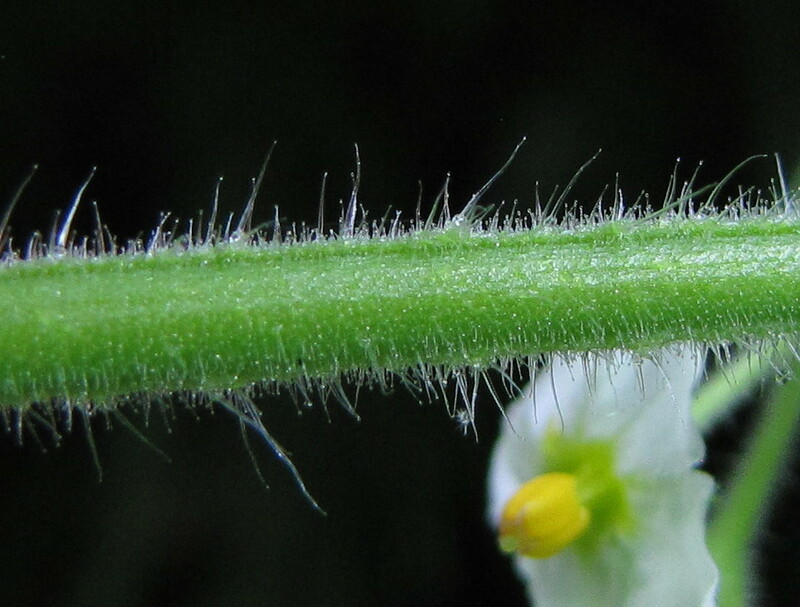 Dense glandular hairs are the most notable characteristic of Hairy Nightshades. 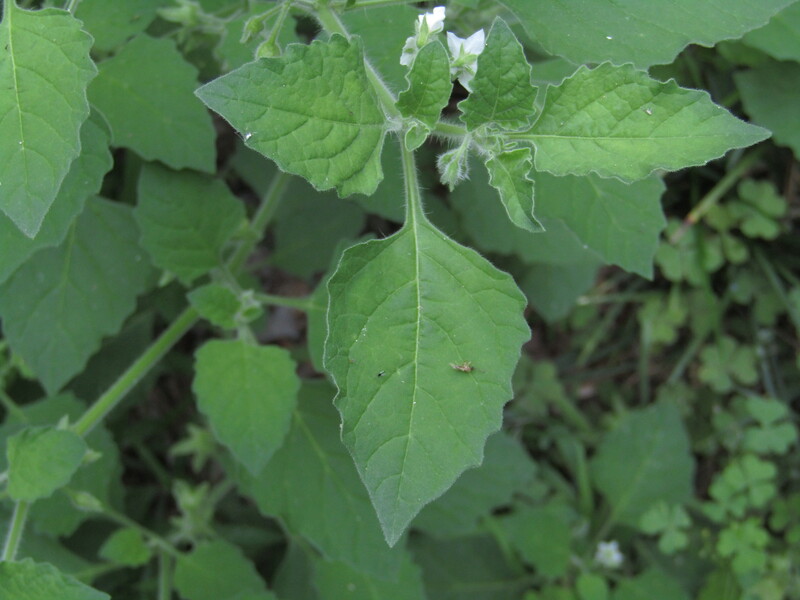 Another common name for the plant is Viscid Nightshade. The glands appear to be stipitate glands, simply meaning that the glands occur at the end of stalks. The following photos are closer views of the glandular hairs. 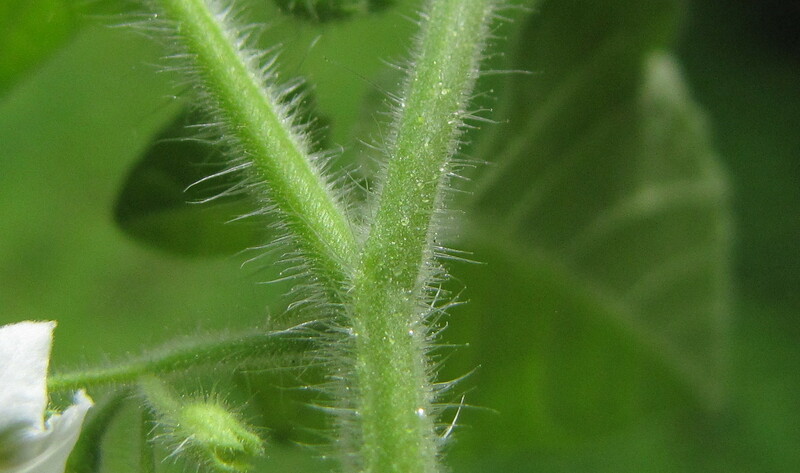 Note in the final two photos the globes of fluid visible at the ends of the stalks. It is believed that these glands evolved as a means of transporting toxic wastes out of the plant body, where they serve as an early line of defense against insect or mammalian predators. 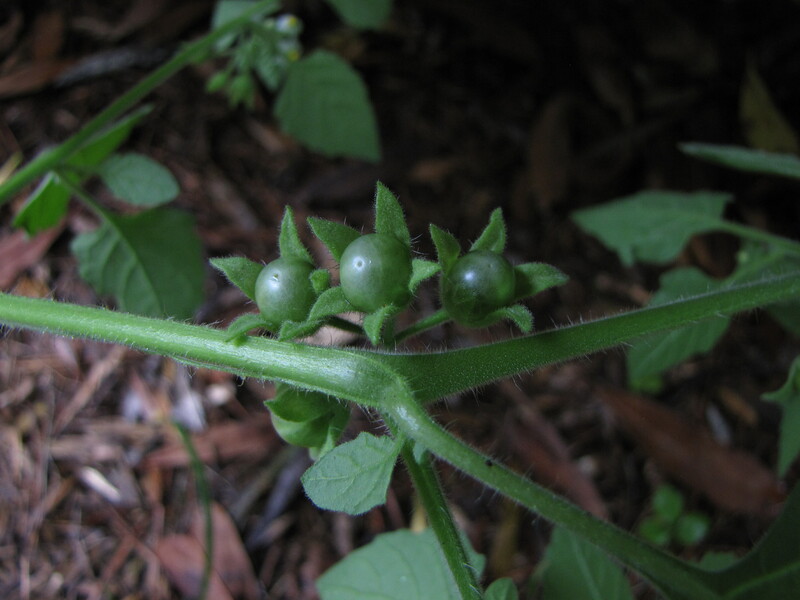 Our commonest North Carolina nightshade is the ubiquitous Horse Nettle (Solanum carolinense), found in large numbers everywhere in North Carolina. 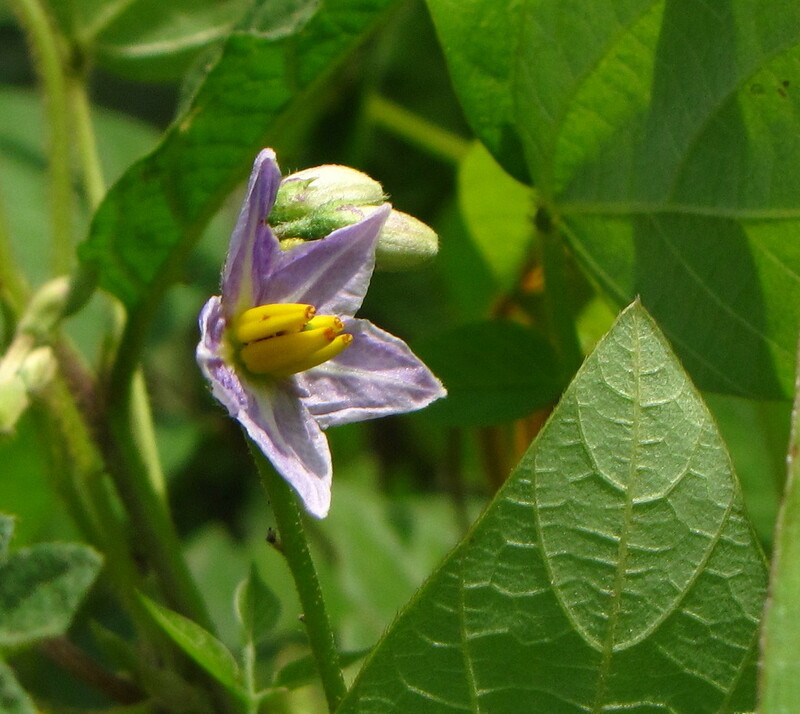 As the name implies, Horse Nettle has arrays of sharp, tough spines on the stems and middle leaf ridges. 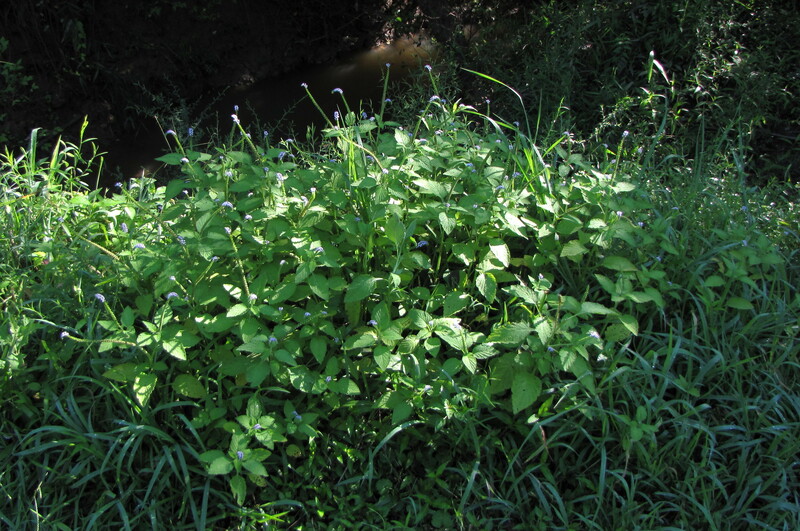 The flowers are larger than most nightshades and color can range from white to a light or deep violet. The berries turn bright yellow in the fall and winter, and stand out against the bare winter landscape. 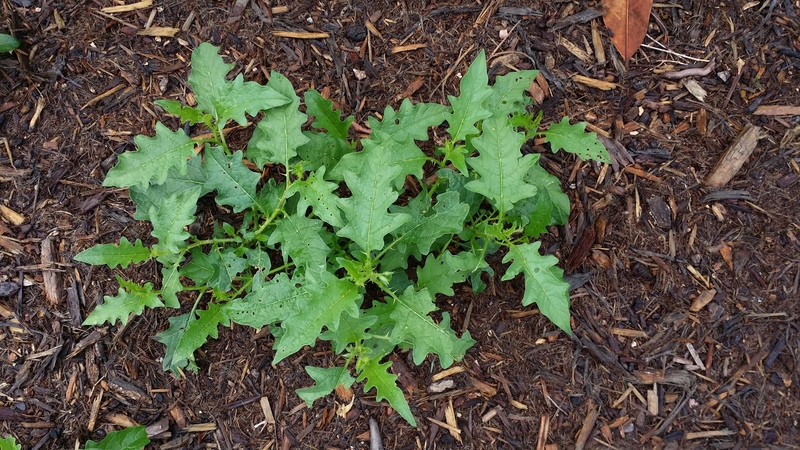 The basis for the toxicity of these two plants and other nightshades is a glycoalkaloid called solanine, which is found throughout the plant and berries. Toxicity varies tremendously depending on many factors, especially environmental and genetic. All are potentially dangerous when ingested. 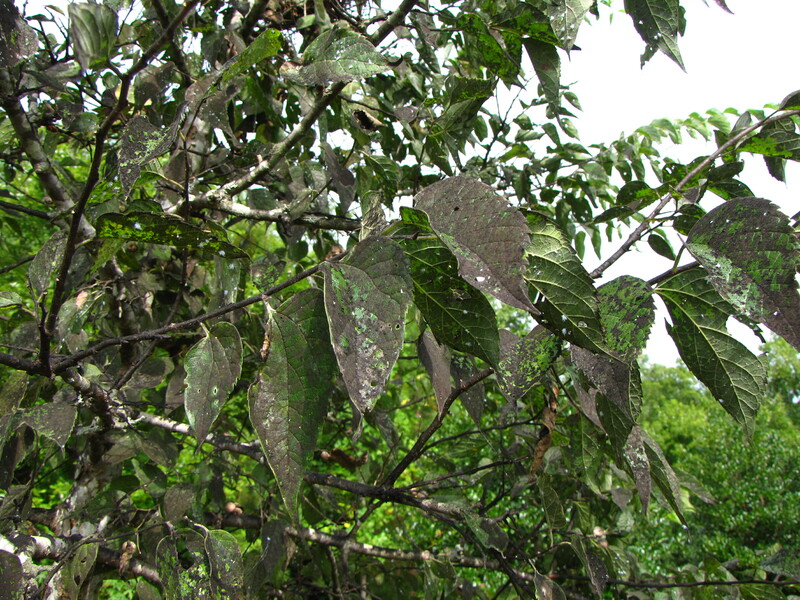 In general, the berries are more toxic when they are young and the foliage is more toxic when it is mature. The lemurs mentioned earlier in the article are vegetarians, but primarily fruit eaters. So it is likely that they ingested berries rather than leaves. 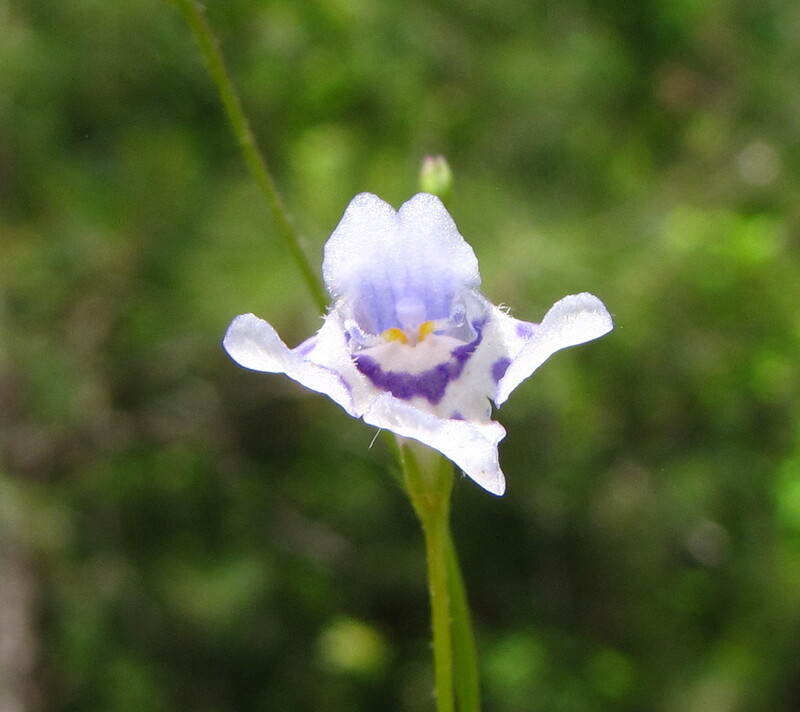 Lindernia monticola, Flatrock Pimpernel, is a small native perennial primarily associated with granitic flatrock and outcrop plant communities in North Carolina. 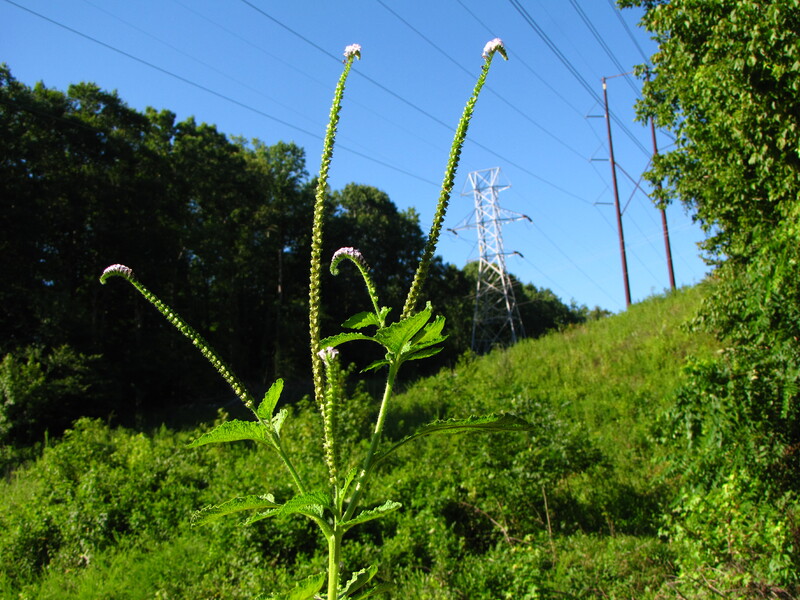 It is listed by the Natural Heritage Program as a Watchlist 1 plant with a rank of S2 – (Imperiled). 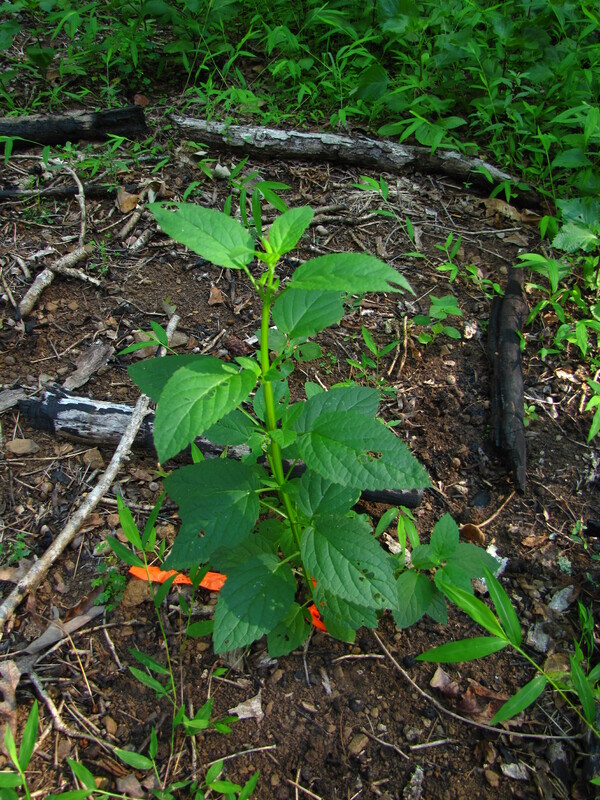 Watchlist 1 plants are rare, but are considered relatively secure and do not require specific site monitoring. 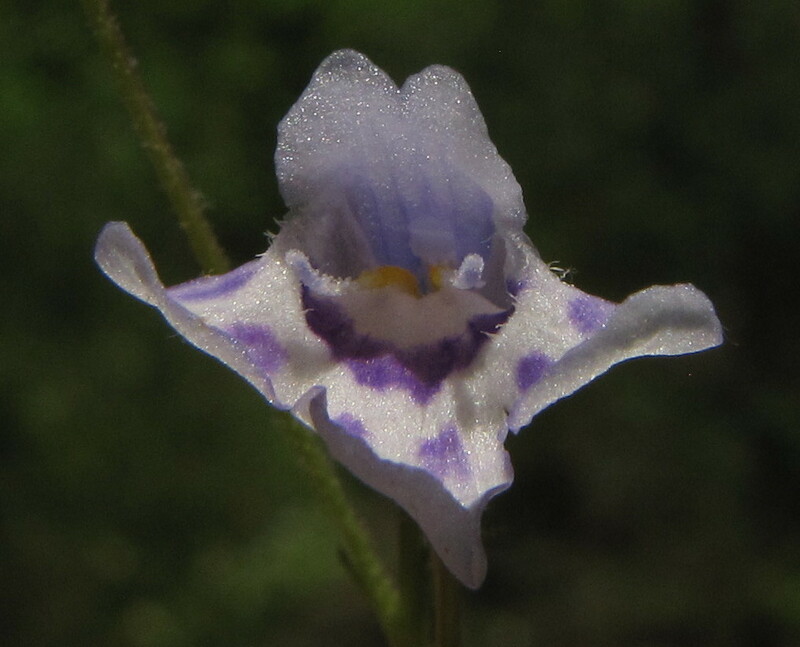 Lindernia monticola is one of only two species of Lindernia in North Carolina, L. dubia being the other. 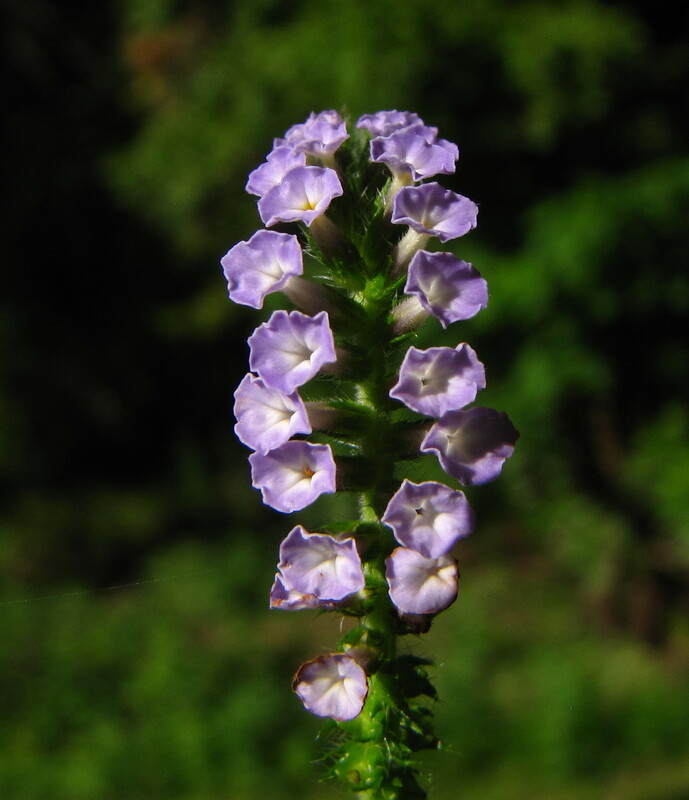 Both are members of the Linderniaceae family, sometimes known as the false pimpernels. Another common name for L. monticola is Piedmont False Pimpernel. 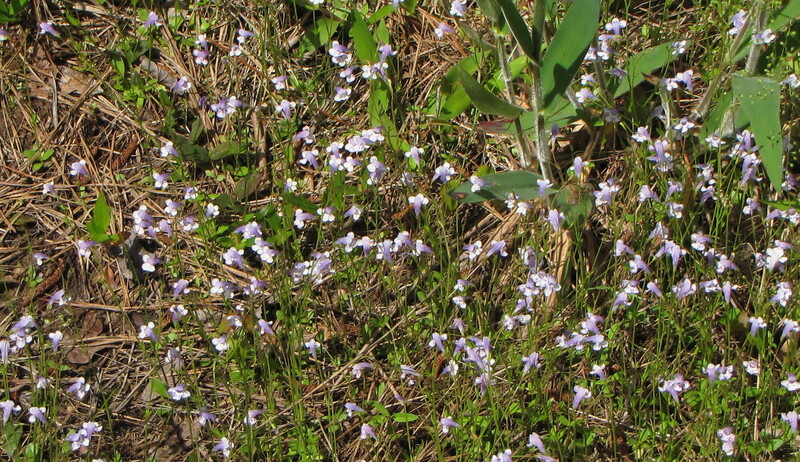 Below is a photo of a small population seen at a granitic flatrock in early May, in Wake County, NC. 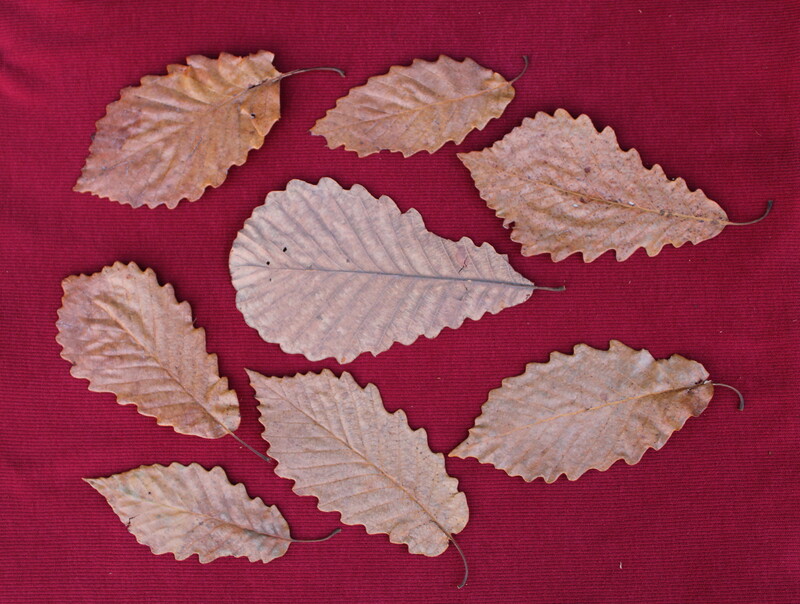 As seen below, the leaves are short and elliptical, and are found almost entirely in a basal rosette. 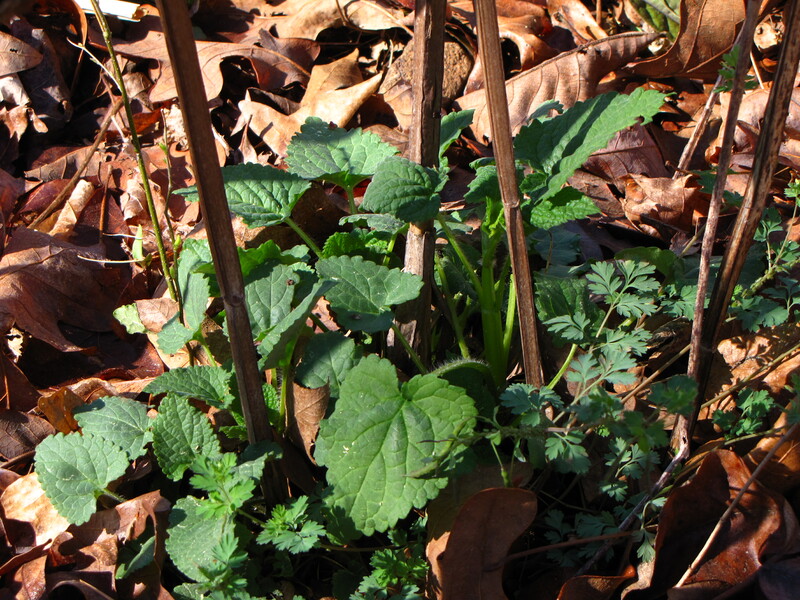 As the stems shoot upward, the leaves become greatly diminished until they are barely visible. As the two photos below illustrate, even at the margins of the flatrocks, there remains enough soil depth to support competitive grasses and sedges. The flowers are illustrated in the two exposures below. The two lobes of the upper lip of the flower, as well as the three lobes of the bottom lip can be easily seen. 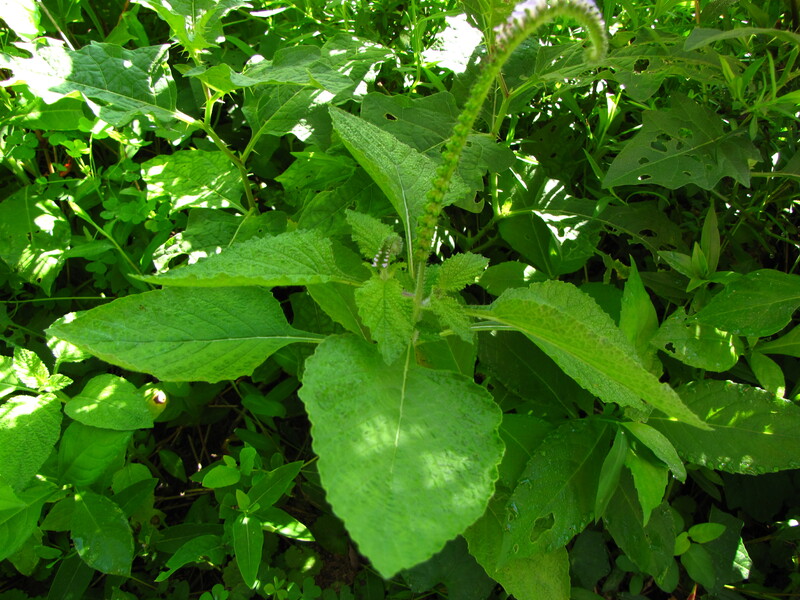 The basal leaves are said to be glandular and punctate. 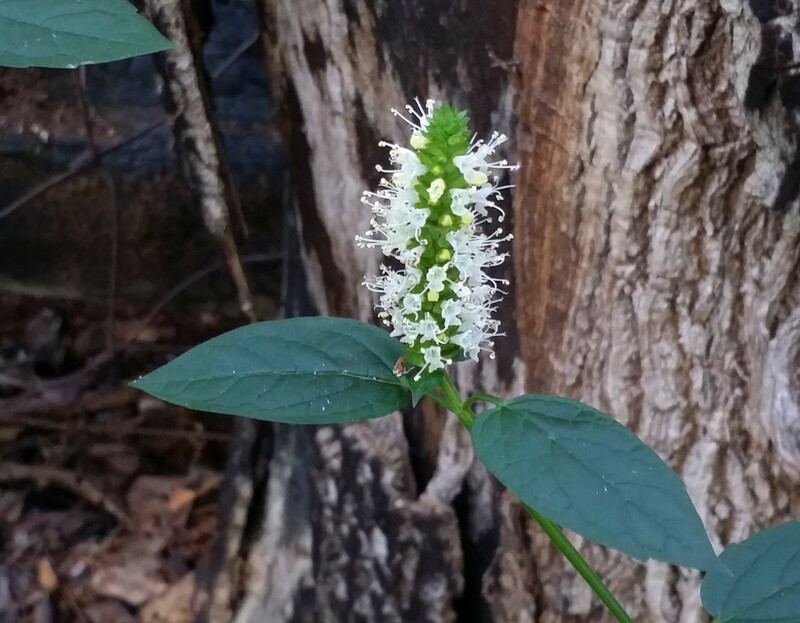 The flower in the second photo appears to show similar characteristics. There are various definitions of pimpernel. The one that fits this purpose best is a plant belonging to the primrose family, especially the scarlet pimpernel – Lysimachia arvensis, which is a non-native. It would be logical that a false pimpernel would be a plant that looks like a pimpernel but is something else. However, the Lindernias and the primroses have entirely different flower forms, and it would be quite a stretch to mistake one for the other. It would be interesting to know how the false pimpernel got its name.